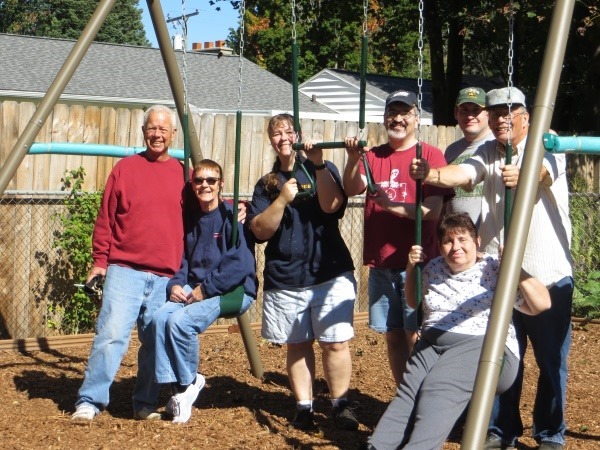 Spoiler Alert – We finished the swingset last Saturday! 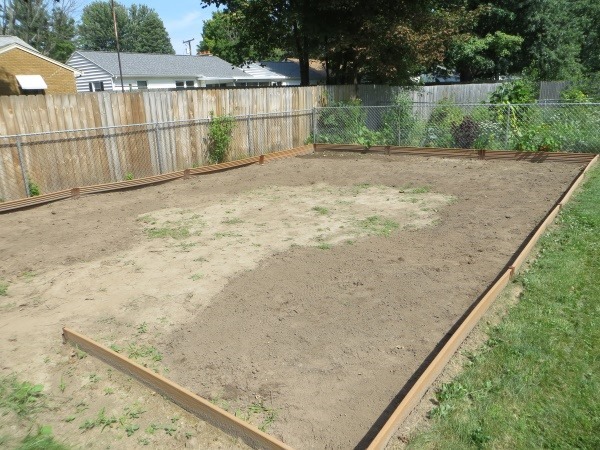 What started out as a large Christmas gift turned into an all-summer project. You may recall that in "Kitchen Faucet", I included an in-progress picture of "the pit" as a teaser. Here is the full story. 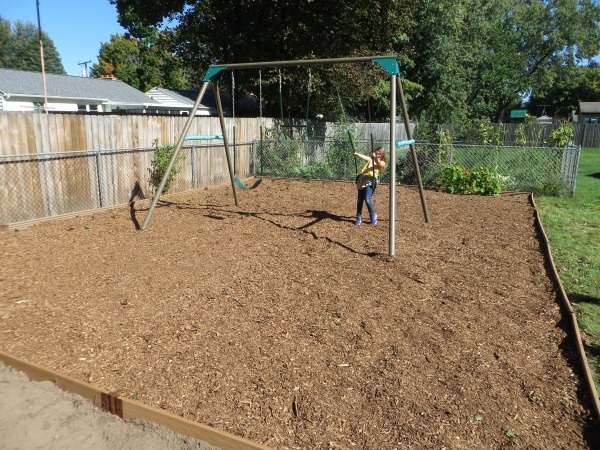 In the spring, CJ downloaded the instructions for the swingset, and found that the manufacturer recommended a 25’x36′ box, filled with at least 9 inches of mulch or pea-gravel for safety. 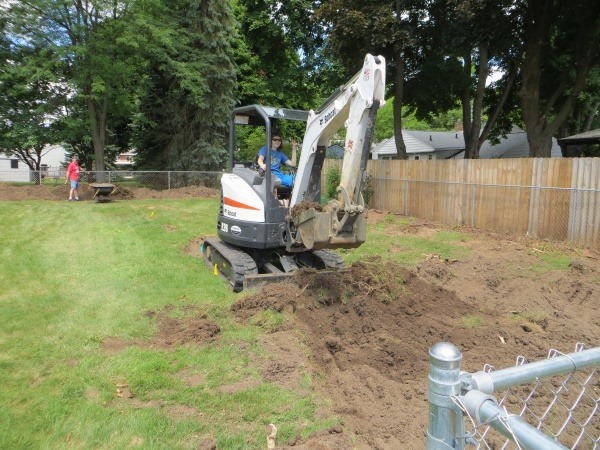 We didn’t relish having a 9" or 12" step up to get to the swingset, so we made the decision to dig down, and sink the box into the ground. 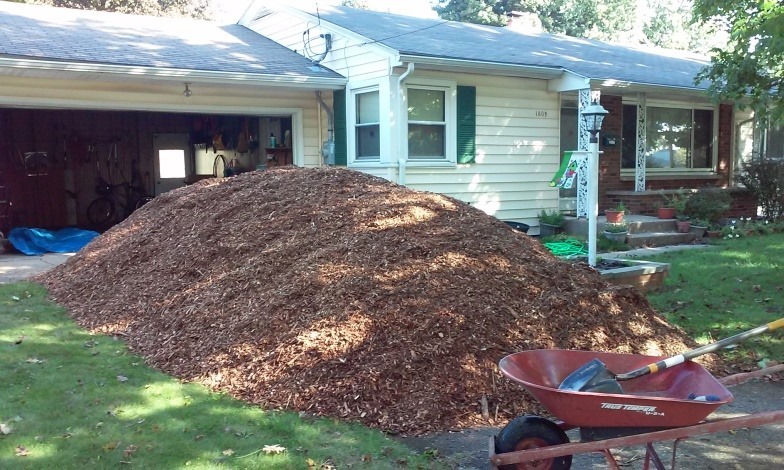 Let’s see – 25′ x 36′ x 9" = 25 cubic yards. 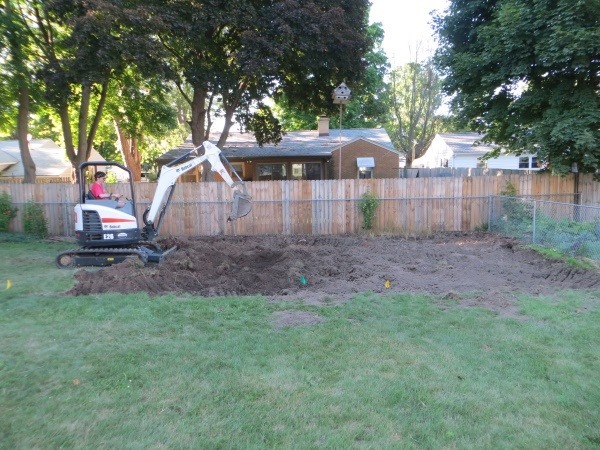 “Moving 25 cubic yards of root-laden, rock-infested dirt shouldn’t be too hard by hand, “ said No One Ever. 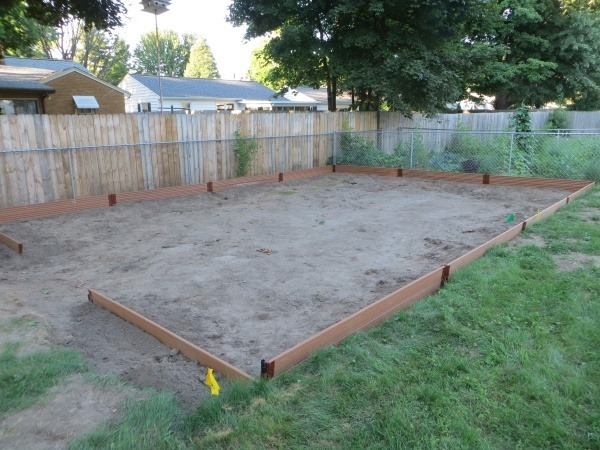 I spent one entire Saturday in June trying it, and managed to move less than 1 cubic yard. We needed a better option. CJ and I talked about hiring it done, but we were trying to keep costs down. 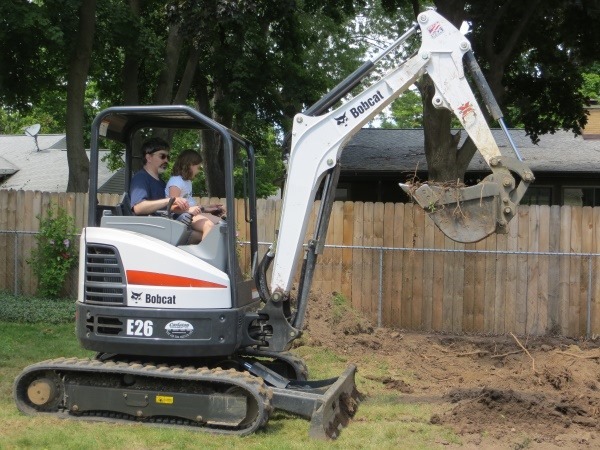 Then CJ asked, "Could we just rent a Bobcat?" Yes. Yes we could. Things went a LOT faster after that. 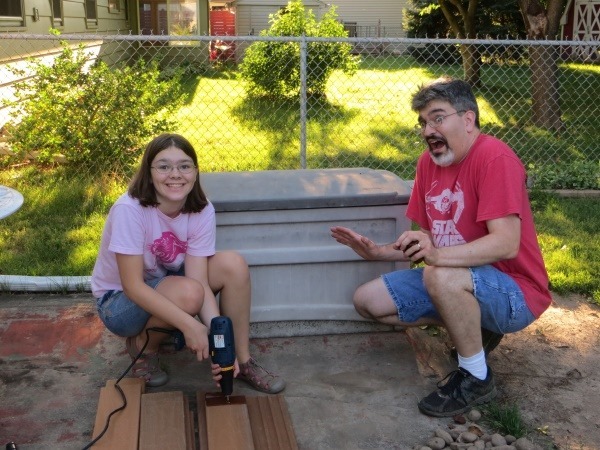 Of course, being a family project, the entire family had to get in on it. And we were all geeking out about it. 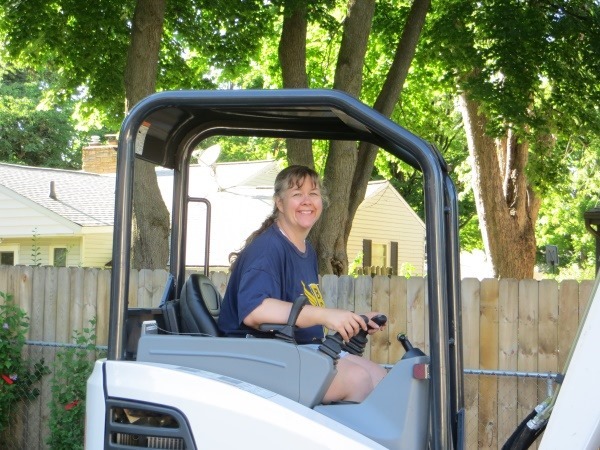 Driving the Bobcat never got old. 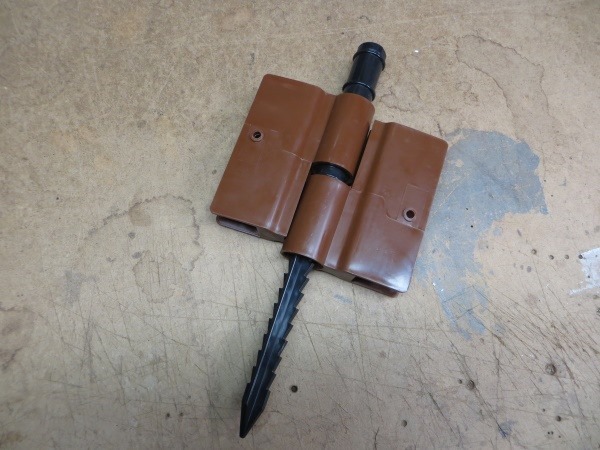 These brackets mount to the end of a 1×6, and the spikes drive into the ground. 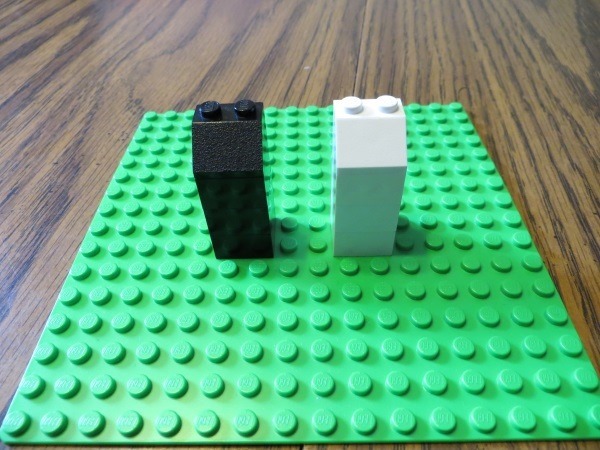 The spikes come in two varieties – ground spikes and stacking spikes. The latter would allow us to stack two boards, one on top of the other. We started in the back corner, and worked our way around the pit. 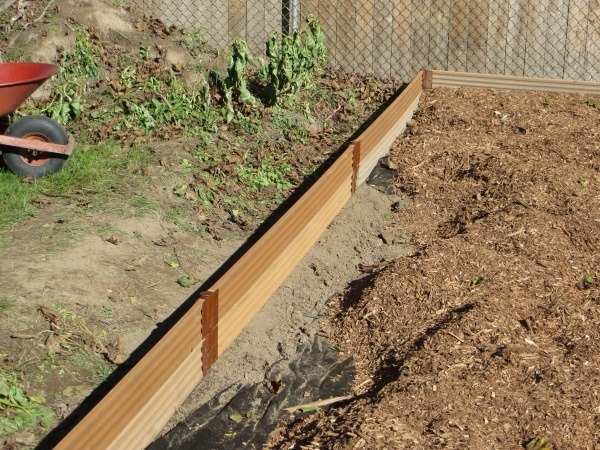 We intentionally left out one entire section of the box as a "ramp", thinking ahead to when we would have dozens (if not hundreds) of wheelbarrow-fulls of mulch to drop in. Before we could get there, though, we found we needed to put some of the dirt back. Apparently, we went a little overboard with the Bobcat in taking it out, and there were places that were several inches deeper than we wanted. 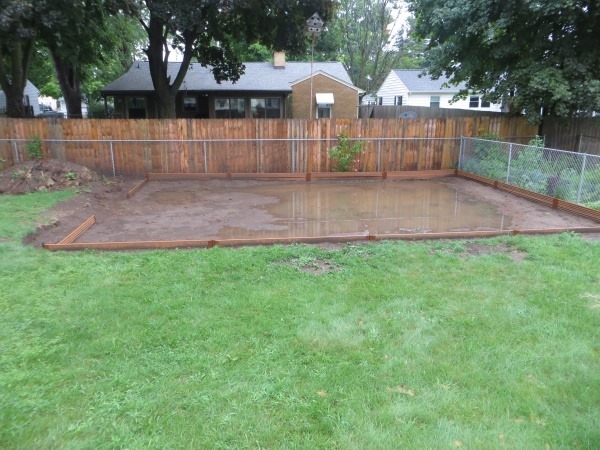 That took us several weekends to complete, mostly because a) it kept raining on the days we were going to work on it, and b) we were really, REALLY getting sick of moving dirt around. The day we finished it could not come soon enough. 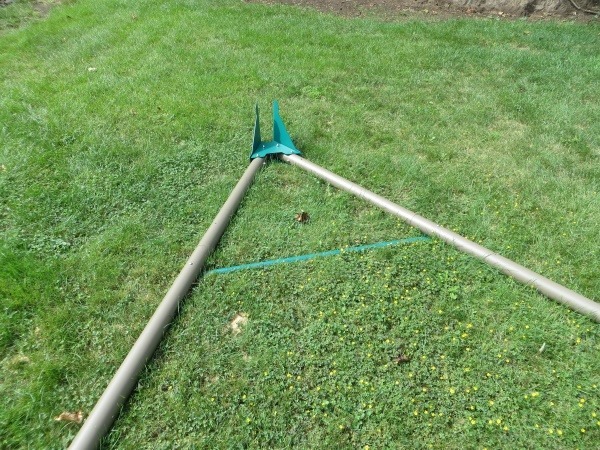 Now it was on to the swingset itself. We unboxed it, and found our first step was to pummel the snot out of innocent scraps of wood. Ok, the pummeling served to drive the A-frame pieces together so they were snug, but the wood wasn’t fooled for one second. Then we got to step 2. Ah yes, step 2. We need how many bolts? And we have HOW many bolts? We found we were missing at least one entire bag of hardware. So, we assembled what we could, and put in a call to the manufacturer for replacement parts. The parts came in a week or so later, and we resumed assembly. Only to find that we STILL didn’t have enough parts. CJ, not wanting to wait another week or more for parts, ran out to Lowe’s and found screws that matched what we were short on. That allowed us to keep going, and not waste the rest of the day. 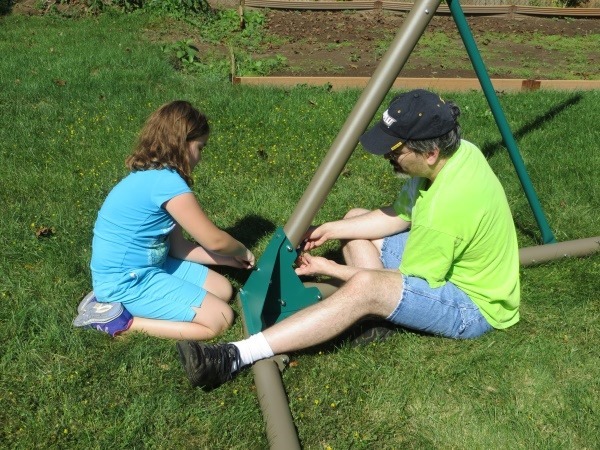 CJ and I got the swingset upright, and I tightened everything down. The two of us moved the set into position, and discovered to our utter amazement that it was nearly perfectly level right where it was. Then, of course, we had to try it out. You know – break it in? 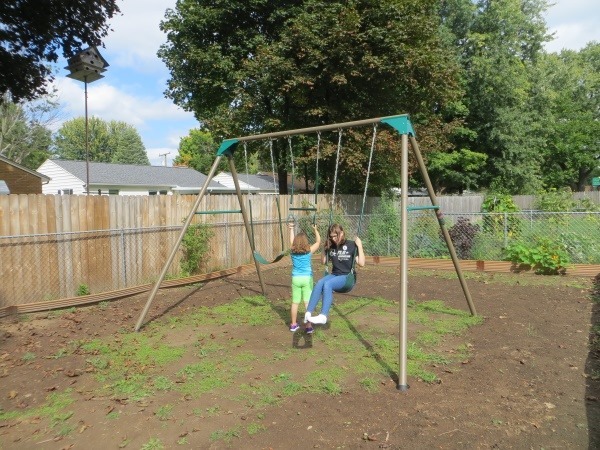 We added the swings themselves, guestimating how high they would need to be once the mulch was in place. 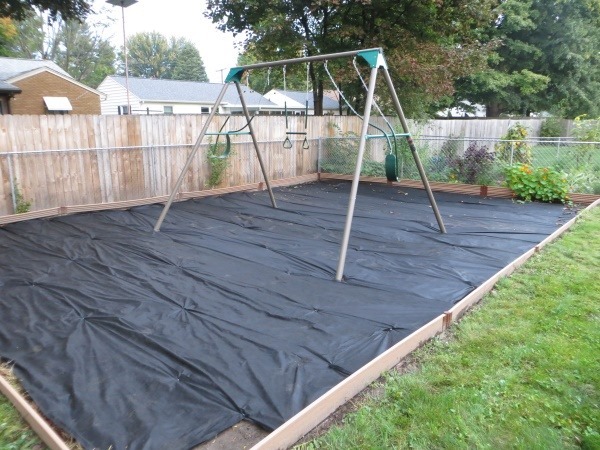 Before we could get the mulch in, though, we needed to lay down weed fabric. It didn’t take very long, but it sucked – literally – because of all of the mosquitos out that night. 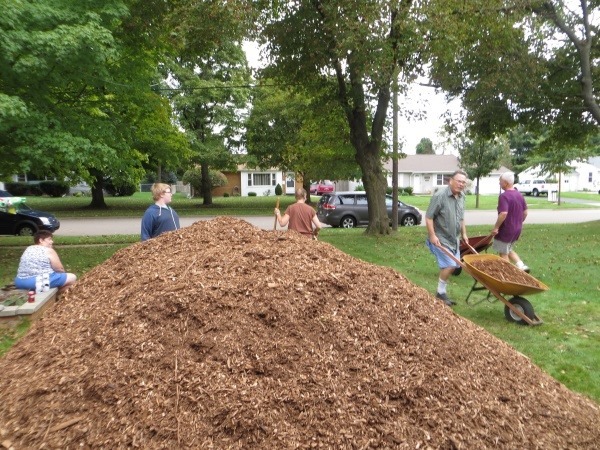 And then came the mulch. 22 cubic yards of it. And an army of helpers to move it. 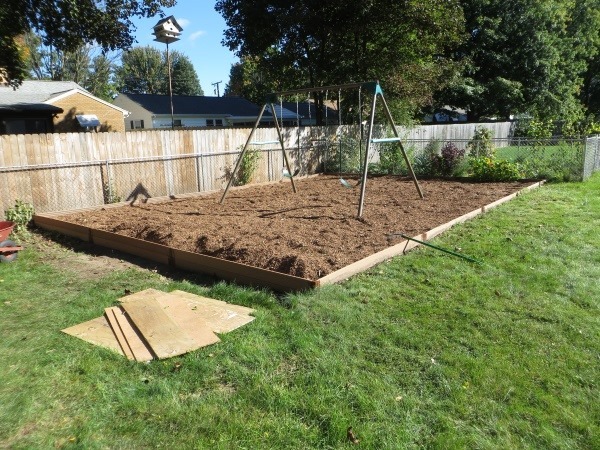 We put wood down the ramp, and through the middle of the pit to keep the wheelbarrows from tearing up the weed fabric. 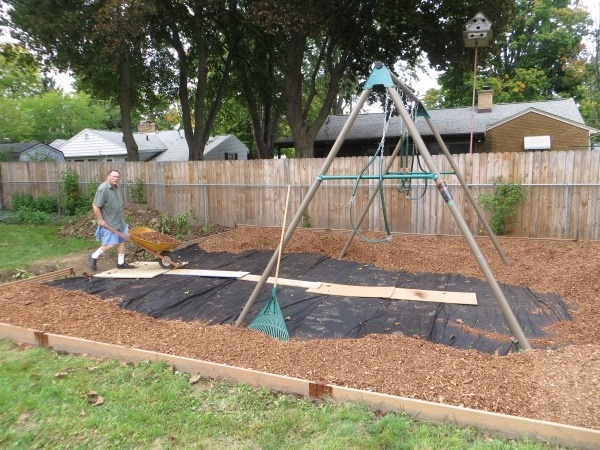 Then we raked the mulch into position. It worked fairly well. Once the bulk of the mulch was in, we finished the wall. We were storing the extra wood behind the house, where it was shielded from the sun most of the day. When you put those next to the ones that had been out in the sun for weeks, you can really see the difference. 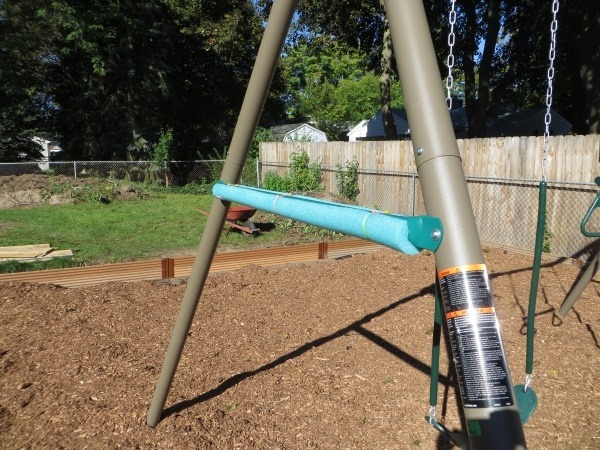 We strapped some pool noodles to the cross-beams on the swingset ’cause running into those things with your forehead ends the happy thoughts. Ask CJ how she knows. 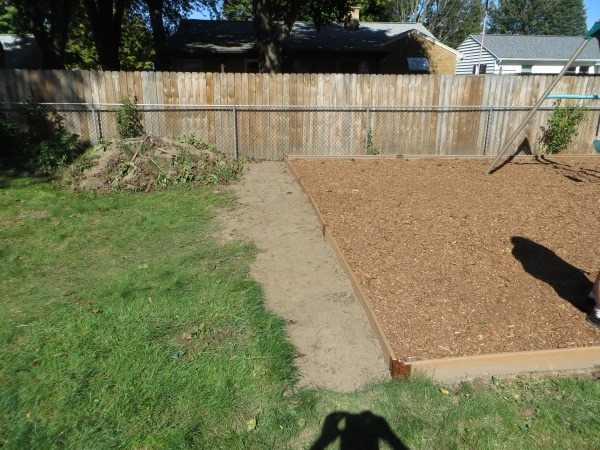 We filled in the rest of the mulch, and also filled in the outside of the box with dirt to level things out again. The big pieces of this project were now done. 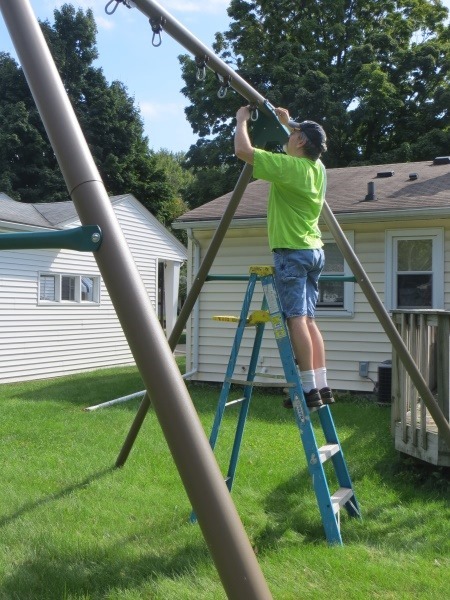 A huge thank you to all the grandparents, John from down the street (not pictured), and my brother for helping bring this massive project to a successful conclusion. 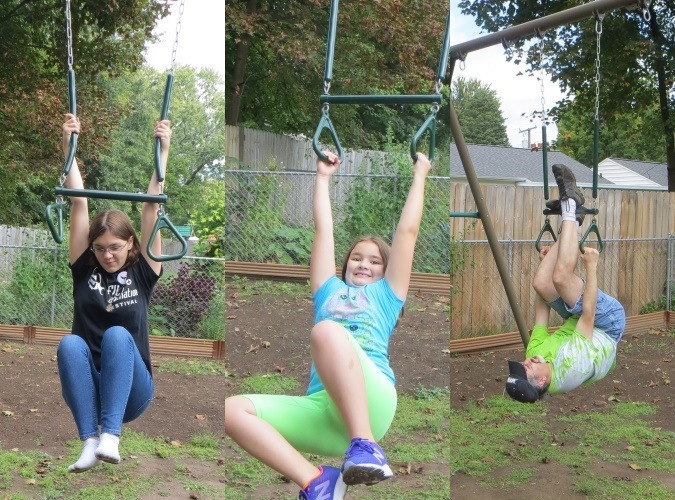 The girls love it, and every day since we finished have asked "Can I go out and swing?" (More on that project later.) Needless to say, we decided to work inside today. 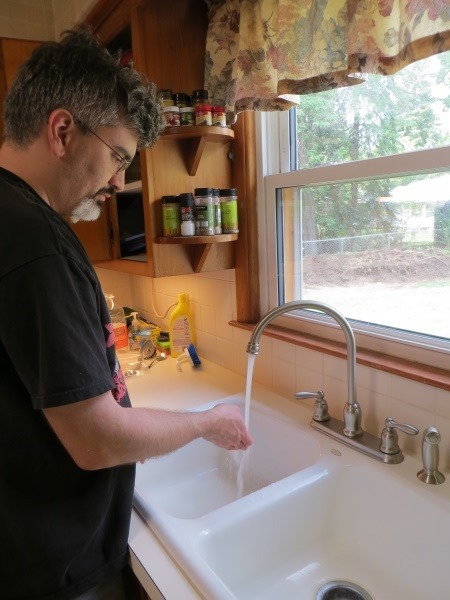 We chose another home improvement project – replacing the kitchen sink faucet. 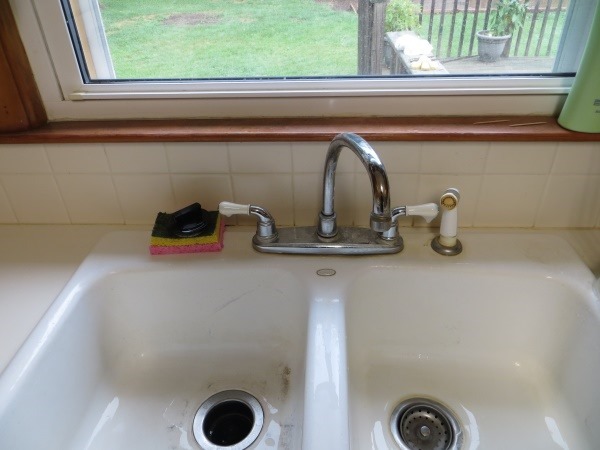 The old faucet had been leaking slowly for months. I’m actually more comfortable working with electrons than water (even though the electrical projects frustrate me sometimes), but CJ and I decided it was time for it to go. So, even though I approached the project with more than a little trepidation, I threw myself into it. 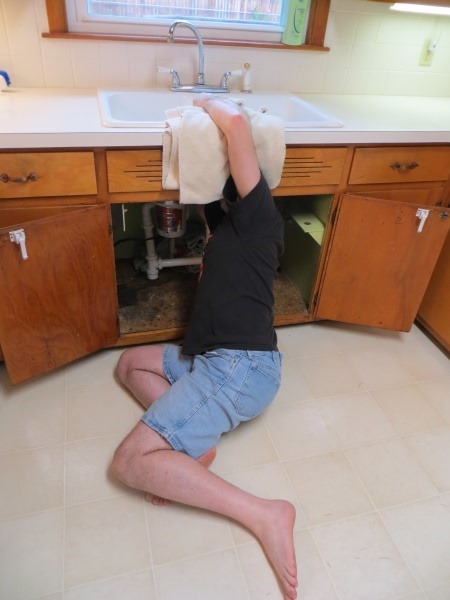 The first task was to get the old faucet off. Two out of the three plastic nuts holding the faucet in place came off without too much trouble. The third one wouldn’t budge. 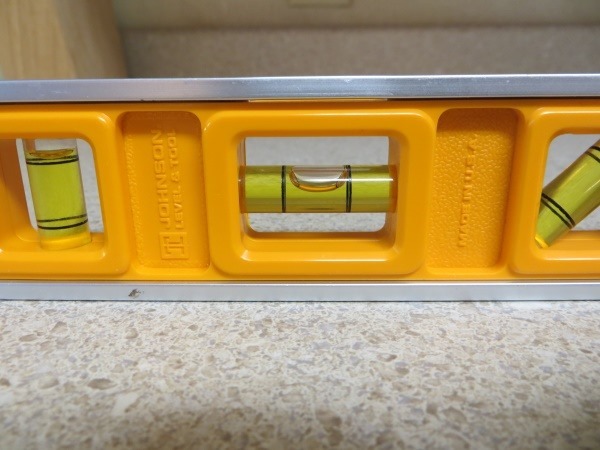 There wasn’t a whole lot of clearance to get a wrench or a pair of pliers in, and I was working above my head while lying on my back, so it got increasingly frustrating to work on. After several minutes of swearing praising the solid construction, I decided to take things to the next level, which included options such as hammer, chisel, and my electric drill. 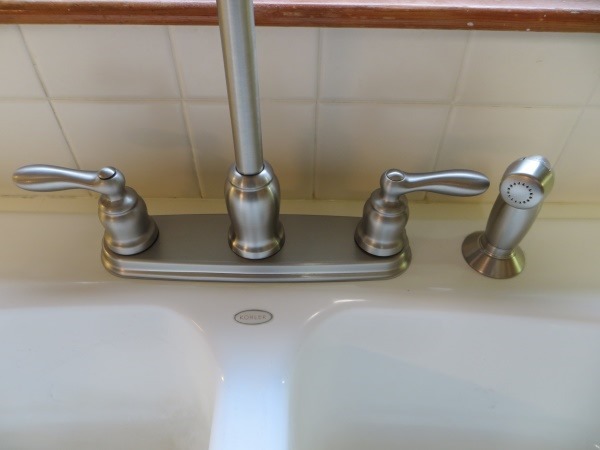 After we cleaned up the sink, CJ ran out to get the new water lines, and Katherine and I got the new faucet mounted. Wow – that’s going to look pretty nice. Dad, this is why we can’t have nice things. 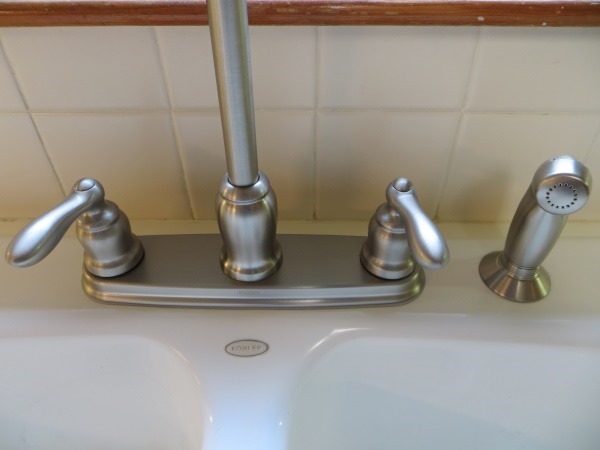 Surprisingly, installing the new faucet seemed to be going very smoothly, but twice when I was coming out from under the sink, I nailed my head on these. More loud comments about the solid construction. CJ soon returned with the water lines, and with lunch. 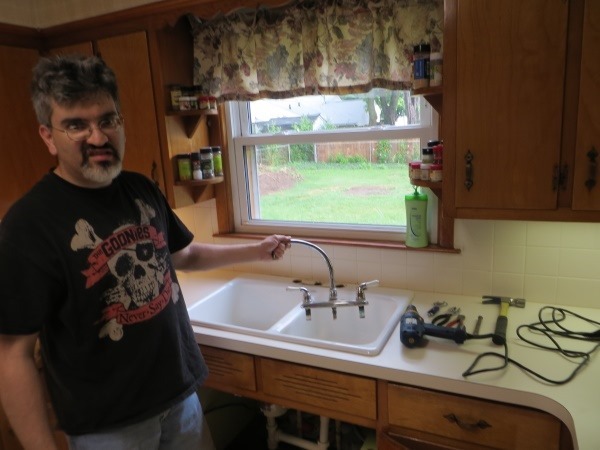 After we ate, I finished hooking up the water lines, and tentatively tried the new faucet. And the hot and cold handles even deliver hot and cold water, respectively! It was nice to have a working sink again. 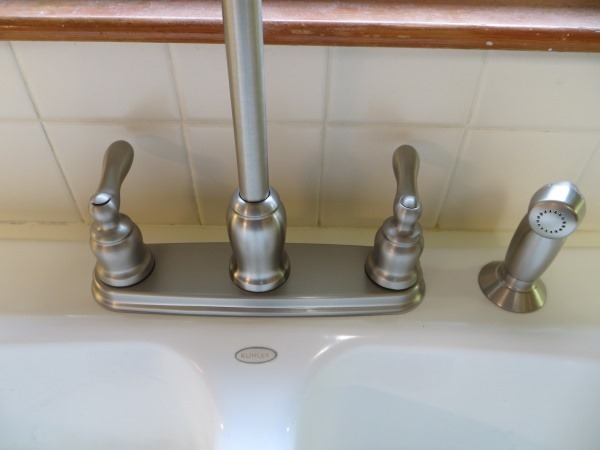 And even with the shenanigans getting the old faucet off, it only took a few hours on one day. That definitely qualifies as a win. It’s that time again. Another Gilbert construction project! This time, our dishwasher of nearly 10 years had to be replaced. 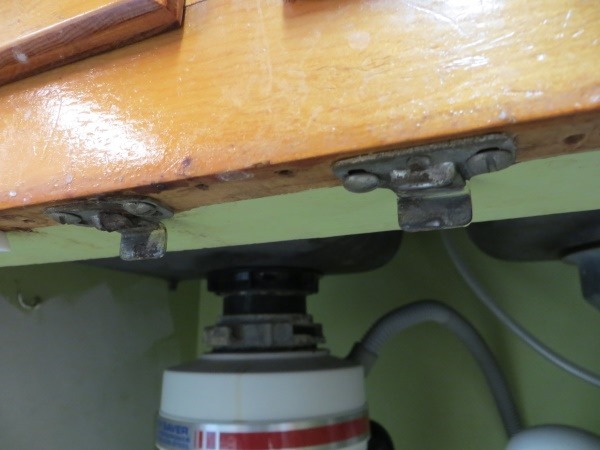 It started out life as a mobile unit – the kind on casters that you could wheel up to your sink, connect to the faucet with a hose, and then wheel it back into a corner when it was done. 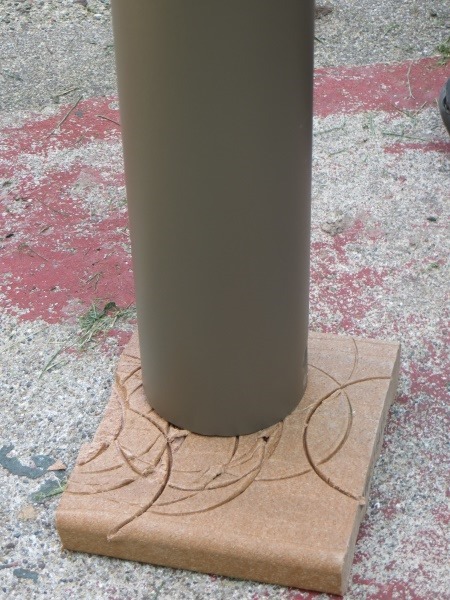 We purchased a conversion kit with it that would allow us to turn it into an in-place unit, which is what you see above. 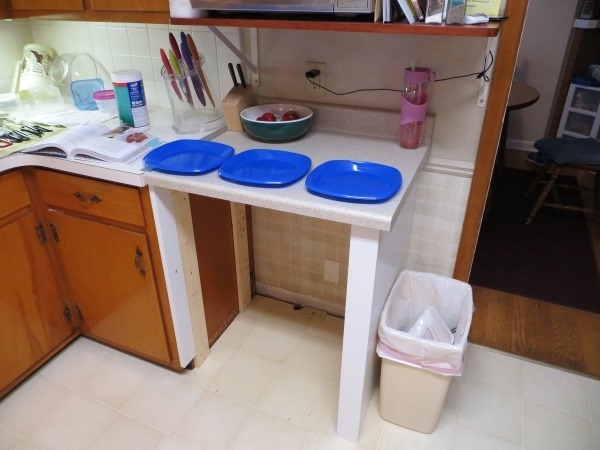 For 10 years, it faithfully scrubbed our dishes, and provided us an extra 2+ feet of counter space. But, alas, in the last six months it’s started to not rinse all of the soap off the dishes, and made a few interesting noises along the way. We decided it was time. 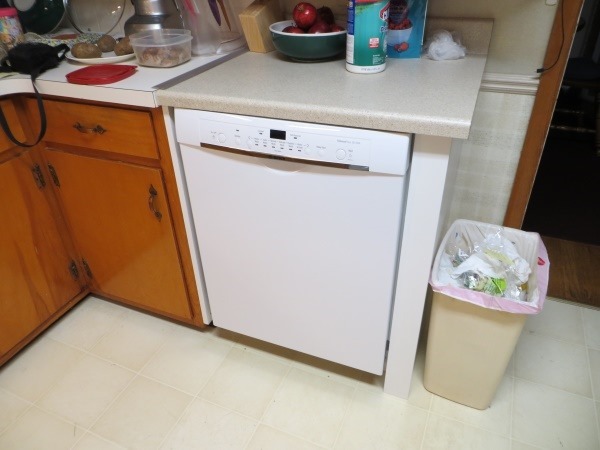 Unfortunately for us, the mobile-dishwasher-that-could-be-converted has gone extinct. No one makes the conversion kits any more as far as we could tell. So, to get a new in-place dishwasher meant building an enclosure for it. This past weekend, that’s exactly what we did. 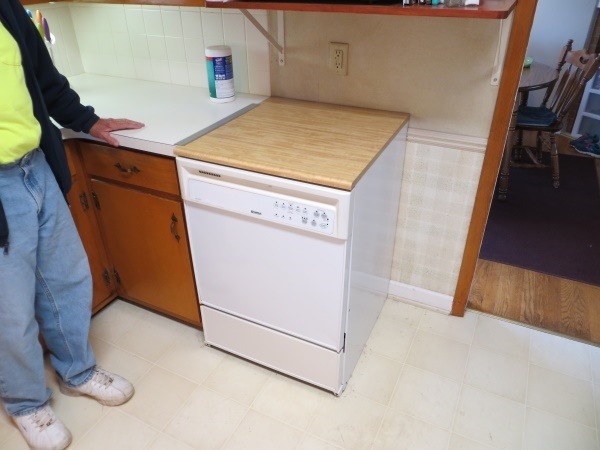 Of course, the first step was to get the old dishwasher out. 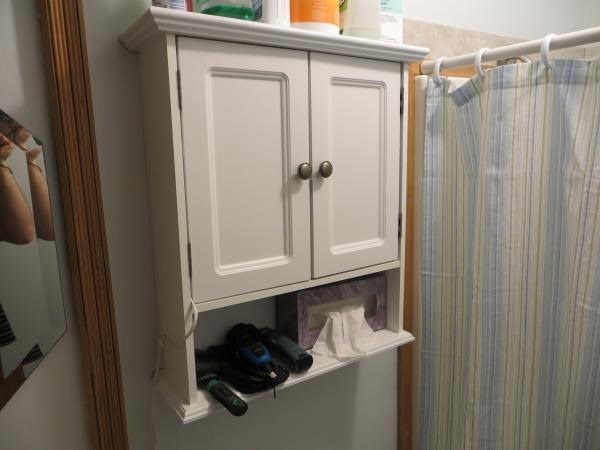 It took my father-in-law and I three hours, and a trip to Lowe’s (one of three I would be making that day), to figure out how it had been attached to the floor and the adjacent cabinetry. It also took me a non-trivial amount of time to figure out how to disconnect it from the plumbing. I’ll save you the gory details, but needless to say I love plumbing when it involves a lopper. Good thing we didn’t want to save those hoses. 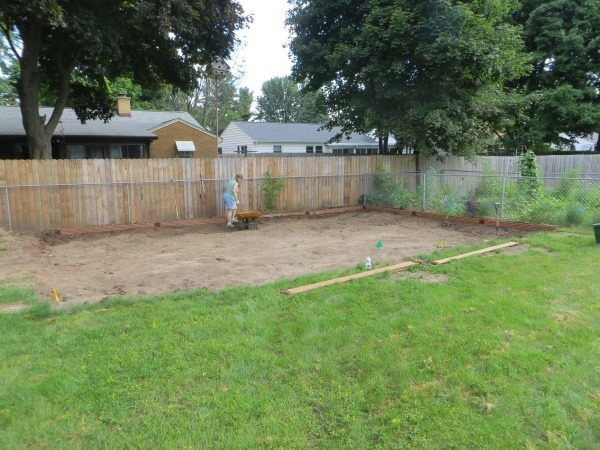 At least now we could start building the framing for the new enclosure. 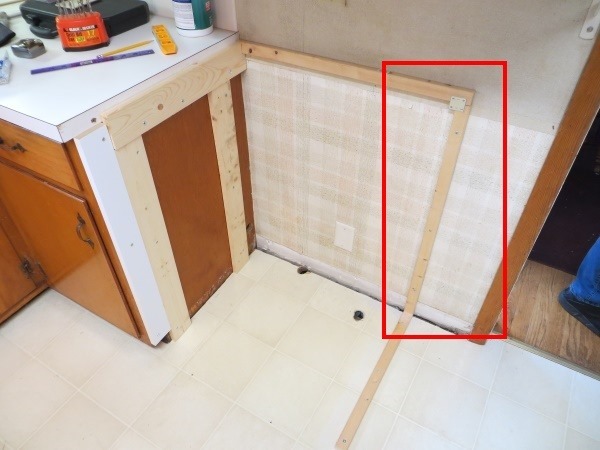 The new countertop would be supported by this framing on the "inside", and a new end panel on the "outside". 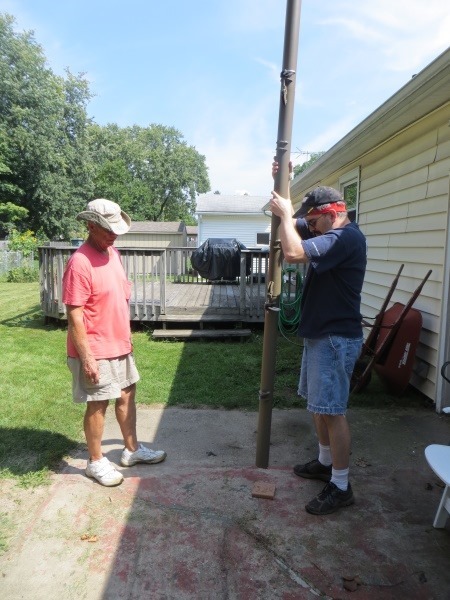 The original plan was to put the second 1×4 all the way in the corner, but when we found where the hole had been drilled for the drain line, we shifted it forward. Additionally, the white board at the very front was supposed to have been a load-bearing member. Unfortunately, I apparently can’t read numbers very well and thought that a 31" long board would magically fit a 35" gap. Ahem. 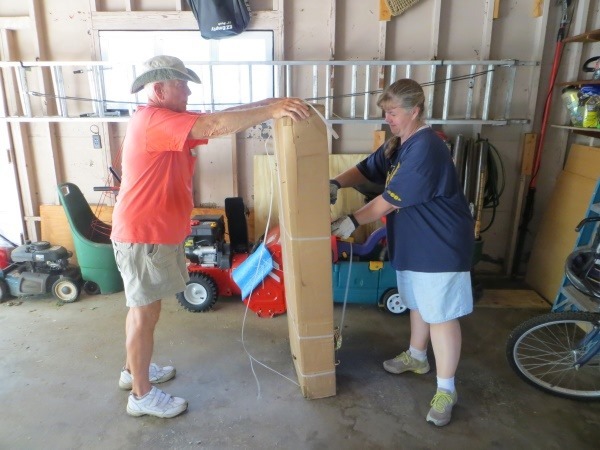 To get around that, we attached it in the front as the show piece, and cut another piece of 1×4 to be the load-bearing member in the front. 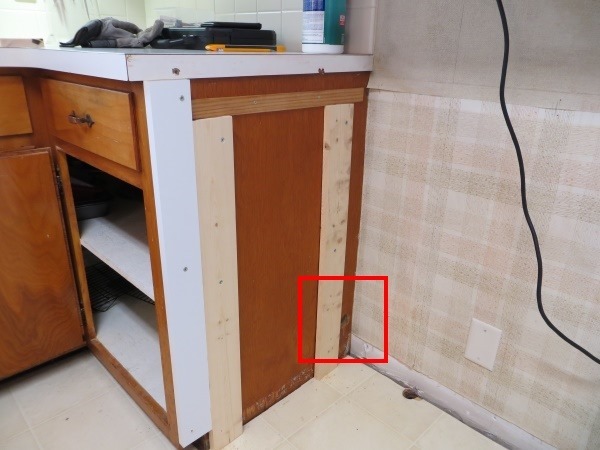 Finally, the existing countertop had a small overhang that prevented us from putting a piece of wood flush against the cabinet, so we added the piece of oak you see going across the top as a spacer. That allowed us to add another piece of 1×4 going across the top as the inner support for the new countertop. I also cut a notch in the back corner for a piece of 1×2 to fit in. We had a fairly substantial gap between the floor and the wall (which you can see here), so the floor-1×2 runs all the way to the wall. 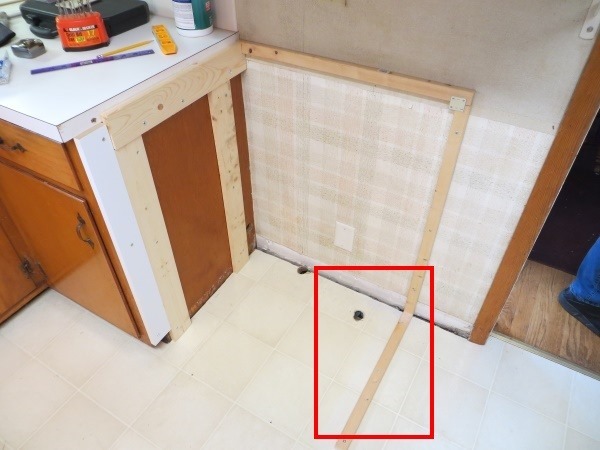 Next, we added a vertical 1×2, sitting on top of the floor piece, and attached it to the wall. With the outer framing in place, I could add the 1×2 running across the back. 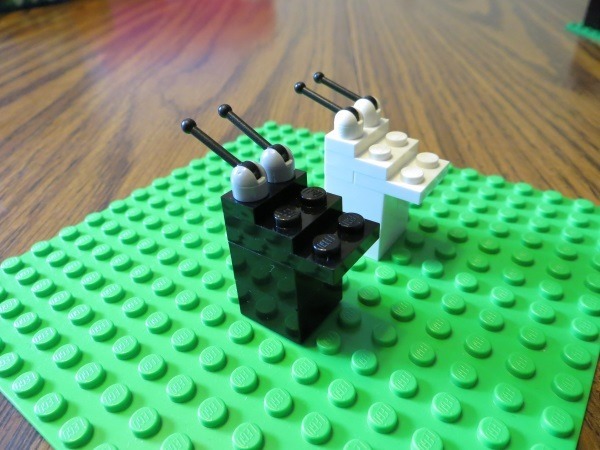 It is attached to the 1×2 via a metal bracket, and merely sits in the notch cut into the 1×4. The new countertop would eventually sit on top of this piece, so we felt it didn’t need any other support. Next we added the end cap. 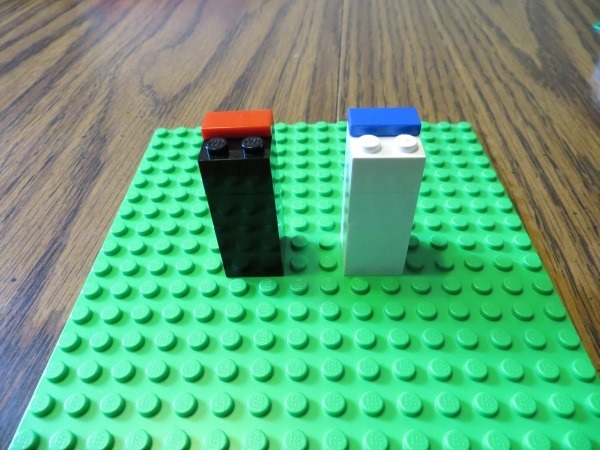 The end cap was attached to the 1x2s via L-brackets, and would become the load-bearing member on the outside. 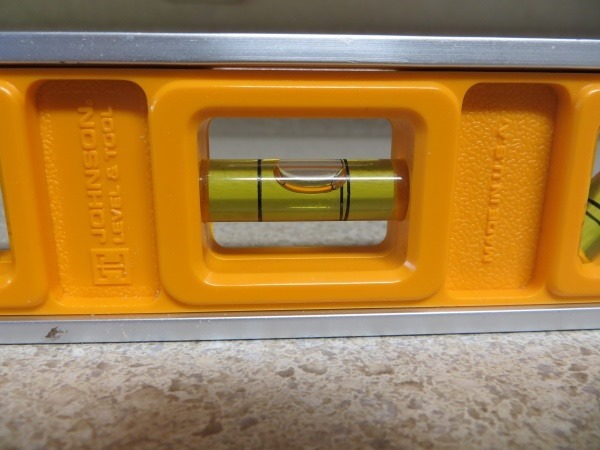 The front of the end cap is a 3" wide piece of fascia, which hides the 1×2 running along the floor. To provide an easy way to attach the countertop, I added four large L-brackets, two to the 1×4 on the inside, and two to the end cap on the outside. 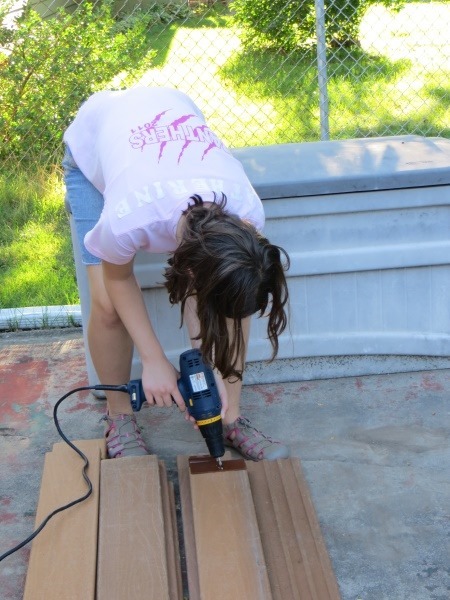 Now we were down to cutting the new countertop to length, and installing it. 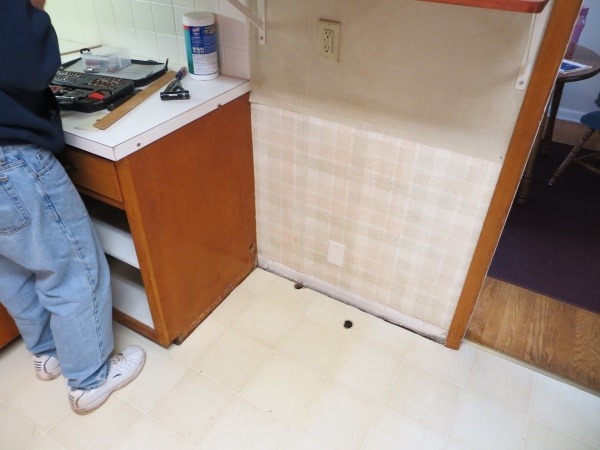 This was honestly the part of the project I most dreaded, mostly because if I did it wrong, I’d have to scrap the entire piece of countertop and buy a replacement. For the most part, we followed the instructions included in this video. We started by measuring the width that we wanted to cut, and triple-checked that the line we drew on the back of the countertop was perpendicular. Next, we clamped down a piece of 2×4 to the back of the countertop, to use as a guide for my circular saw. Unfortunately, the 2×4 had rounded corners, and the guide on my saw kept getting caught by it as I traveled down the countertop. It ended up being less straight and smooth than I wanted it, but everyone agreed it would be good enough. CJ and I agreed beforehand that the side I cut would be the "inner" side, mashed up against the existing cabinetry, so it wouldn’t show. As long as I didn’t take a major gouge out of it, we could make it work. 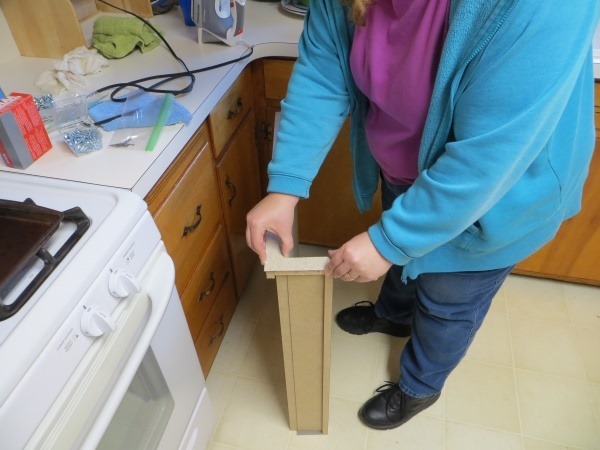 We bought a "finishing" kit that we would use to laminate the end, which required us to tack on a couple of pieces of filler wood (since the countertop had lips on both the backsplash and the leading edge), and then apply the laminate using an iron. 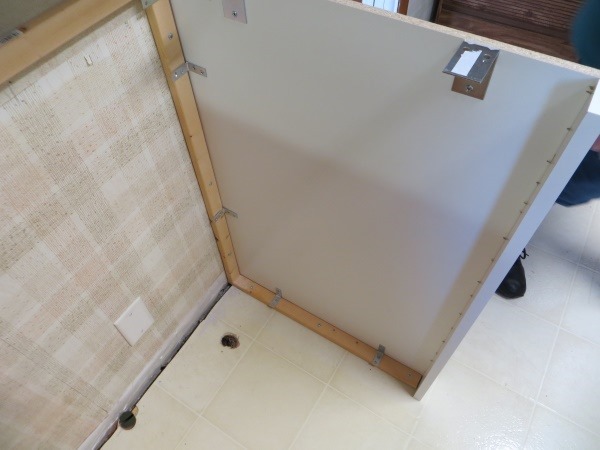 We did this before installing the countertop, figuring it would be easier to iron the pieces on if the countertop was unattached. 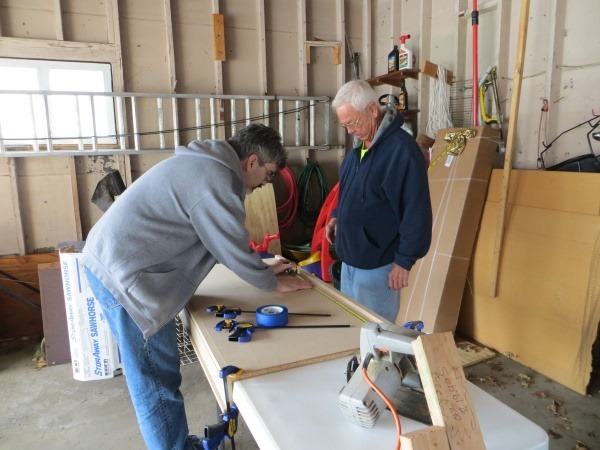 We laid the countertop on the brackets, and took a look at the level. Not horrible, but we would need to adjust it when we screwed it down. 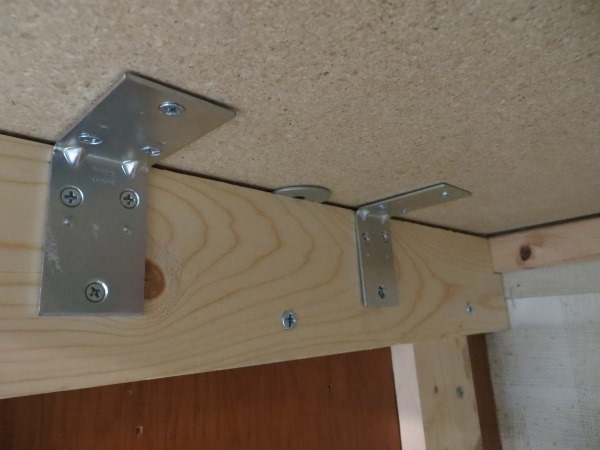 I marked where the bracket screws would go into the underside of the countertop, and pre-drilled holes for each. Before I tightened the screws down on the brackets, I added a couple of washers as spacers to the "low" side, to help level it out. 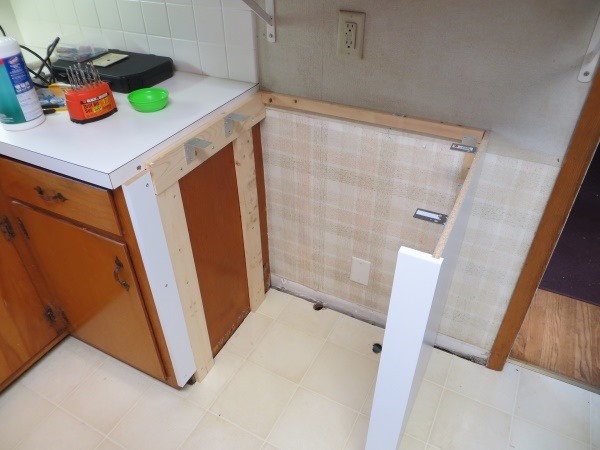 It took us until 9pm that night to get the last bits finished up, but by the end we had a solid, (and hopefully functional) enclosure for the dishwasher. Installer says it will fit! My wife gets me. She really gets me. As it turns out, though, we could have shaved half an inch off the width of the enclosure – there is now a noticeable gap on the left side of the dishwasher. A problem for another day. 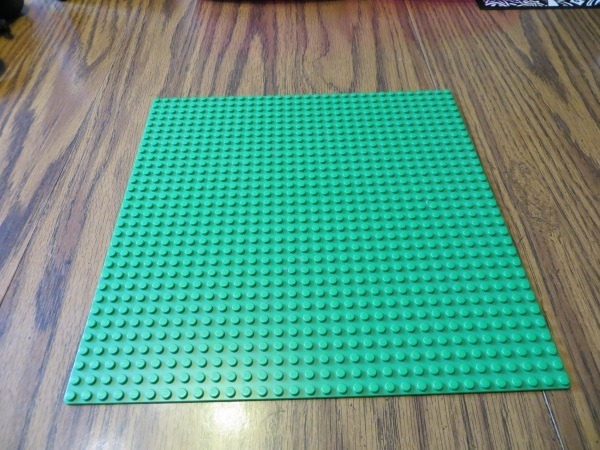 A couple of weeks ago, Lucy and I were building with LEGOs, and I happened to grab one of our large plates. We’ve had several large, square plates like this for a while, but it didn’t occur to me until that particular day to see just how big they were. As it turns out, they are 32 studs on a side. 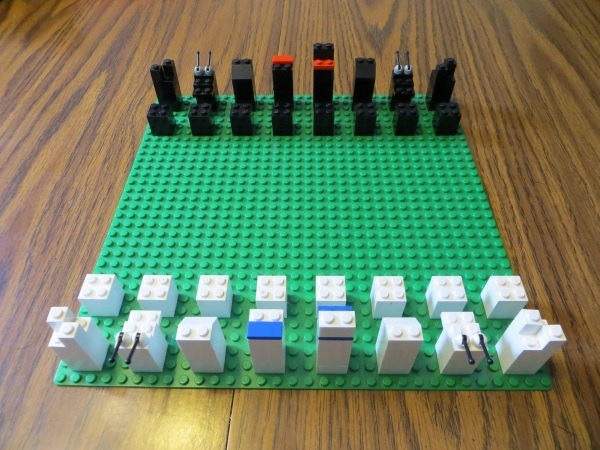 If I were to break the board up into 4×4 blocks, I’d have exactly enough to make a chess board. I realize this board doesn’t have the usual checkered pattern, so it would be very difficult to actually play a game with this set, but I think it’s a great starting point. With this board, I wanted to make sure that the pieces were very distinctive when viewed from above – the normal perspective when you are playing a game. I’ve played on several different boards in the past, and probably the most frustrating thing is trying to tell – at a glance – which piece is which. In particular, it seems to be a running problem that Bishops and Pawns look very similar, differing in height, but not much else. That works fine at the start of the game, but not in the middle game, when nothing is next to each other any more. The "at a glance" issue is worse with the commemorative boards, such as for Star Wars, Lord of the Rings, and Harry Potter. These are gorgeous boards, but it would take a lot of play before I could just glance at the pieces before making a move. 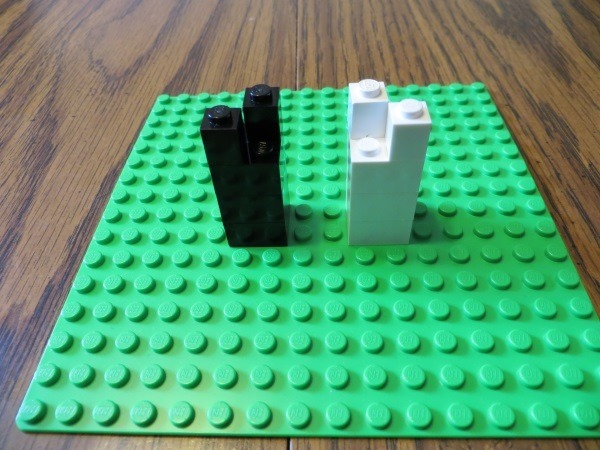 The Pawns are simple, and distinguished from the other pieces by being significantly shorter. With the Rooks, I tried to create a very simplified rampart. The Knights are designed to look like horses. These went through a few iterations before I landed on this version, though. The antenna look like strange stand-ins for ears, but they certainly allow the Knights to stand out on the board. I originally thought about using pure-black antenna on the black Knights, but I didn’t have four of them, and the grey versions stand out better, anyway. Many of the boards I’ve played on have the Bishops’ hats narrow to a point, very much like what a Catholic bishop would wear. 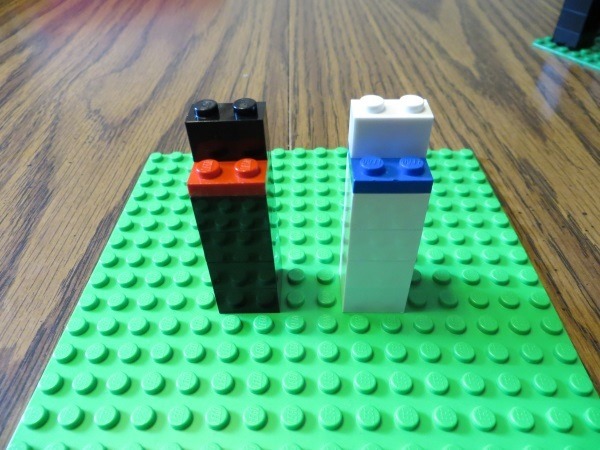 With the LEGO Bishops, I tried to evoke that look with a slanted top. Overall, I think it’s a fine-looking first attempt. 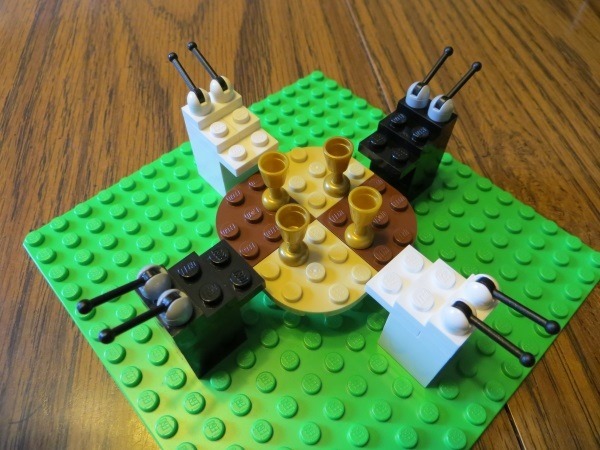 And as a bonus pic, I present you with the "Knights of the Rounded Table". CJ and I put the "labor" into "Labor Day Weekend". Get ready for a home maintenance double header! No, we didn’t host E.T. We had our kitchen fan replaced a while back, and the installer needed to cut a larger hole in the ceiling and then re-plaster it. Priming and repainting a section of the ceiling was asking for trouble, so we decided to do the entire thing. Now, tackling one job over this weekend apparently wasn’t a high enough bar, because while waiting for a layer of primer or paint to dry in the kitchen, we worked on our other project – repainting the tines on our dishwasher racks. But Mark, why not just buy new racks? Surely you can get replacements. As a matter of fact we can get replacement racks, but they would have been half the cost of a new dishwasher. We decided we could spare a few hours of our time to save a few hundred dollars. We got a bottle of Performix ReRack, which with its little brush attached to the bottle cap made it look like white-out (for you kids who are too young to know what white-out is, think "CTRL-Z", but for paper). The catch was we couldn’t just paint the ReRack onto the rust-covered tines. We had to get the rust off first. 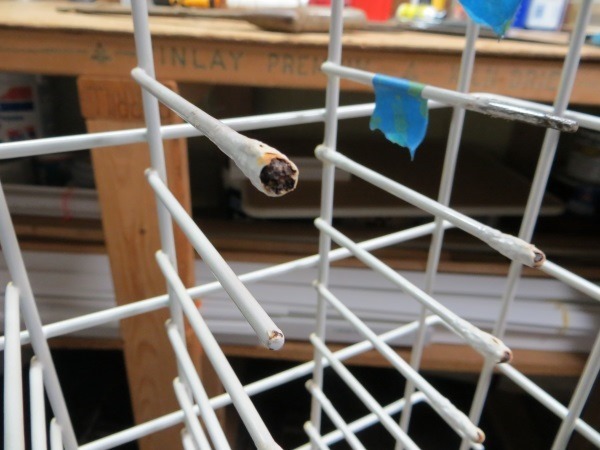 We started by sanding the tines with paper, but graduated to metal rasps. At one point I tried a hacksaw, but I couldn’t get a good angle on the tines to actually saw through them. I tried a pair of snips, but the tines were too thick to allow that to be effective. 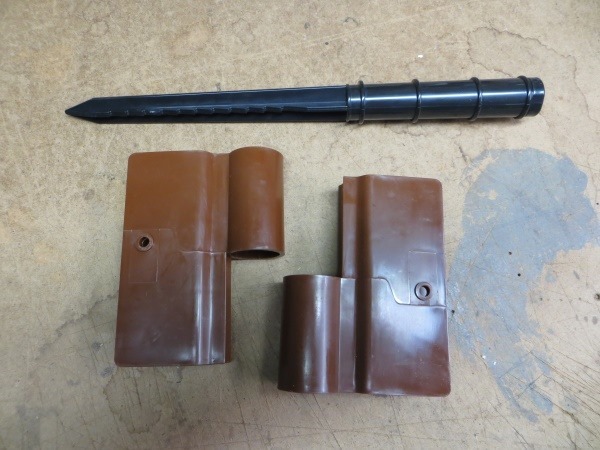 Finally I landed on using a rat-tail file to burrow through half of the tine, then a pair of plyers to snap the bad piece off, and finally a flat rasp to take the sharp edges/points off. That allowed me to get even the really bad tines in a couple of minutes. Each time we worked a tine down to the point where we could repaint it, we marked it with a piece of blue painter’s tape. Did I mention the filing alone took us all day Saturday? If that wasn’t bad enough, the painting took Sunday, Monday, and part of Tuesday because I kept either A) finding tines I had missed, or B) recoating tines that I did get the first time, but had dripped to the point where the metal was exposed again. 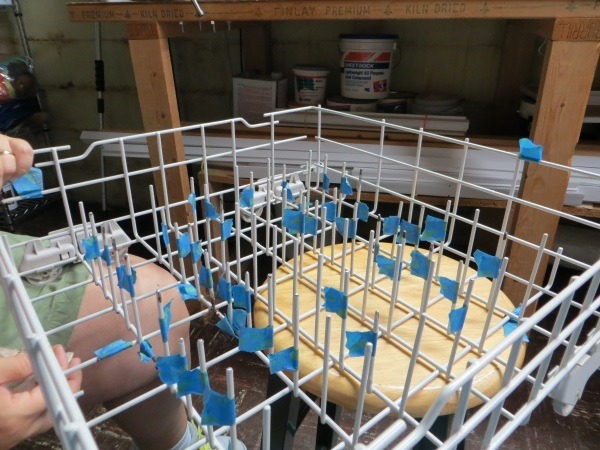 After the third application, CJ could tell I was losing my patience with the project, so she and Katherine did one final coat, and then heated it briefly with a hair-dryer, just to get the ReRack to set up a little faster, and not drip off. By comparison, the kitchen ceiling went very smoothly. We only flung paint across the room once. By Wednesday, we had our kitchen put back together, complete with a functional dishwasher again. Many thanks to all of the grandparents for taking the girls out of the house while we worked. Lucy turned 5 this past week, and for her birthday, she asked to go to Airway Lanes. Lucy loves the bowling, the bumper cars, and the video games, but this year we introduced her to the laser maze. She was initially apprehensive – and that might be putting it mildly – about going in. We tried to tell her it was just a darkened room with lasers. It took us a few tries to figure out that what she was really concerned about was that the lasers were strong enough to cut off limbs. “Oh! No, Lucy, just think of them like flashlights. 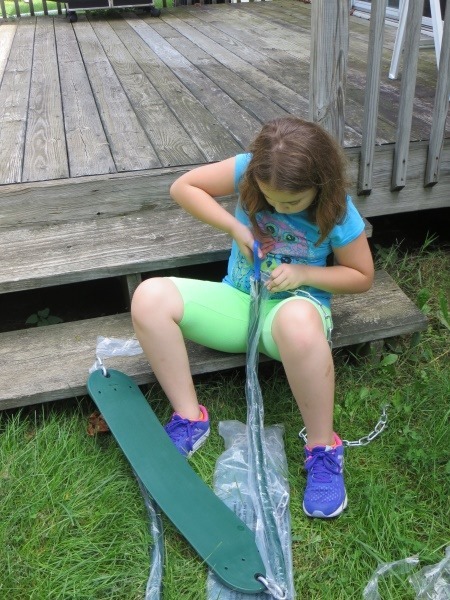 Look.” I put my hand in one and broke the beam. A brief buzzer went off letting me know I hit the light, and that light extinguished. After that, she took took it. And she was really good at it. Of course, being able to walk or hunch under most of the lasers helped, but hey, use what you got. 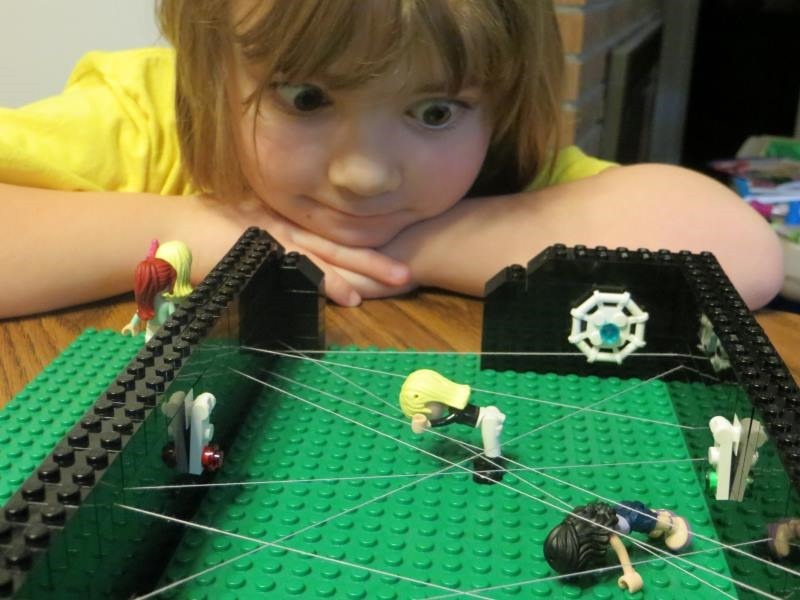 Lucy had been talking about the laser maze all week, and this evening she had been making her LEGO mini-figs pretend that they were going through one. 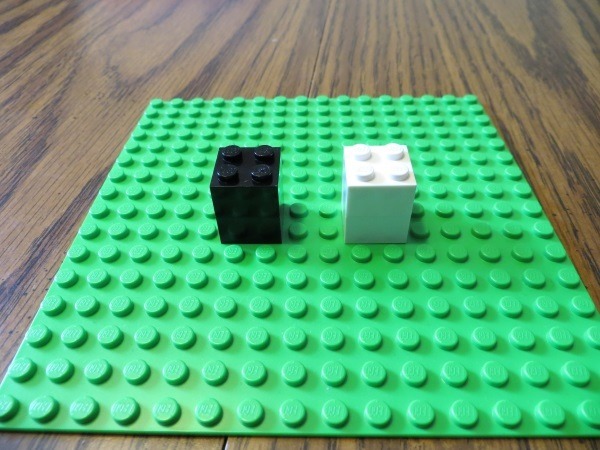 That gave me an idea. 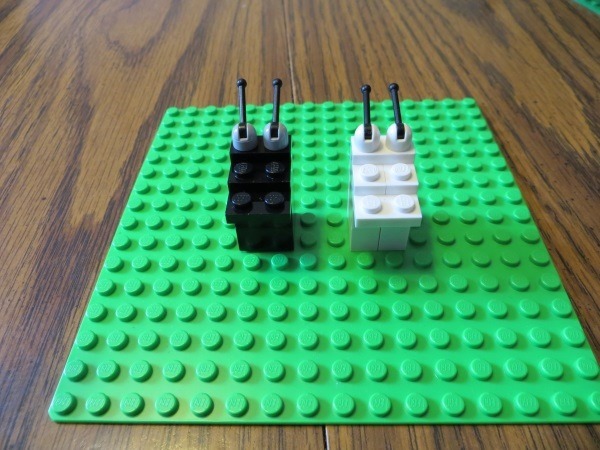 What if we built a small enclosure out of LEGOs, and crisscrossed thread between the walls, simulating the lasers? 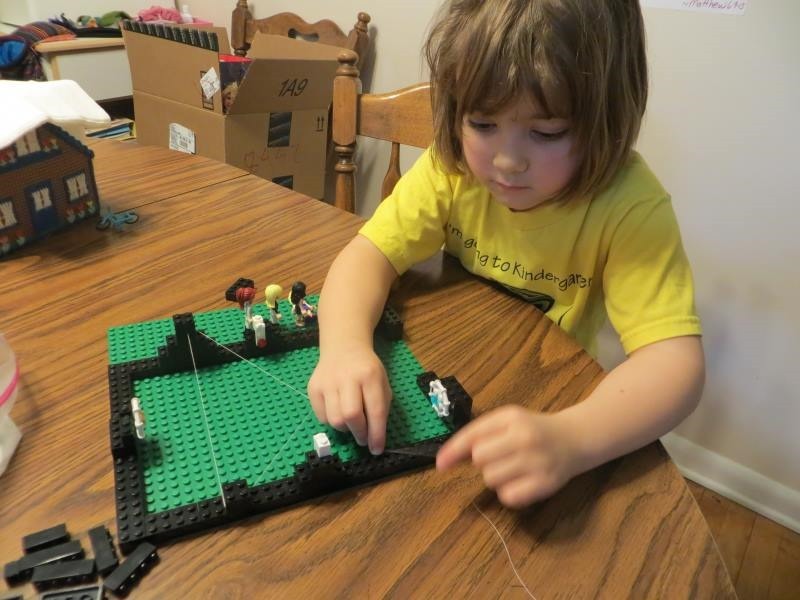 Then the mini-figs would have a much more realistic laser maze! If only I had a few gazillion hours to devote to doing some stop action, we could totally film our own “Mission: Impossible” sequence. Wednesday night I started feeling a strange tickle in my throat. Huh, I thought. The last time that happened I ended up coming down with something like strep. Early Thursday morning, I woke up at 4am, and could not get back to sleep. The tickle had developed into something way more serious, and he invited his friends – Awful Headache and Caustic Cough. To try to get back to sleep, I threw “The Matrix” in. At 6:30, when I finished it, and still was not tired enough to go back to sleep, I slipped downstairs and emailed my boss saying that I was calling in sick. I went through most of the day either in bed dozing, or sitting upright on the couch, dozing. That day is pretty much a haze. 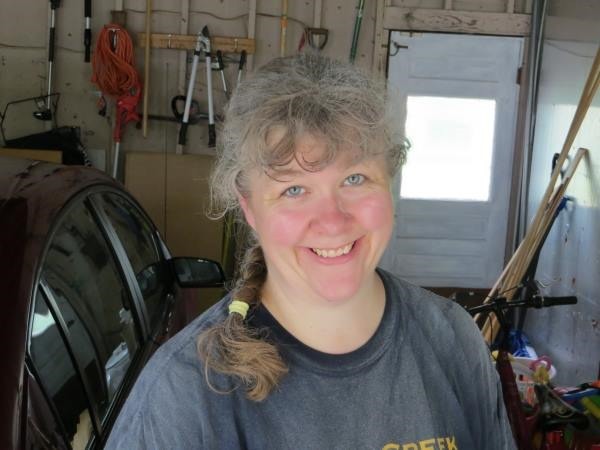 By late afternoon, some of the symptoms had started to subside, and I was able to help CJ get the bathroom trimmed out to be painted. She ended up rolling the first coat that night. I got some antibiotics, and came home. Other than pain with every swallow, I wasn’t feeling too bad, and helped CJ by keeping the girls out of her hair. 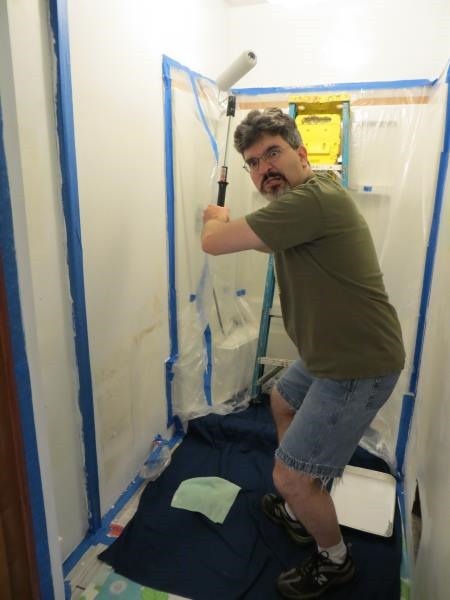 By early evening, we felt we would have enough of the bathroom painted that we could call Brad back in to help put the fixtures back into place. Friday night, CJ started feeling sick, and Saturday she woke up completely miserable. 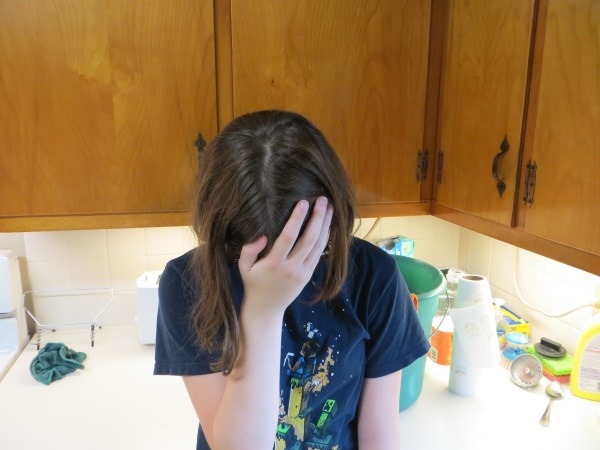 She had many of the same symptoms I had – headache, sore throat, cough – so I figured she had strep too. She went to the doctor, who said that the test for strep came back negative, so she probably had something viral. The only solution was to treat the symptoms. Terrific. As if we didn’t have enough going on this week already. Since I was on the upswing, I went ahead and put as much of the trim back up as I could. 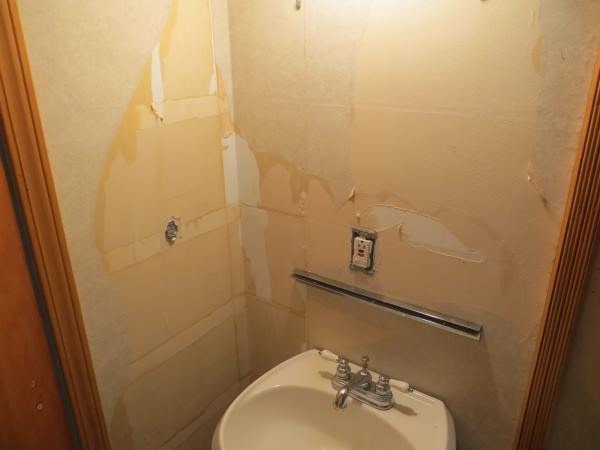 I had to admit, the bathroom was really starting to look good. Even if we were now looking at it through a drug-induced haze. Brad came over and helped me get the fixtures back into place. 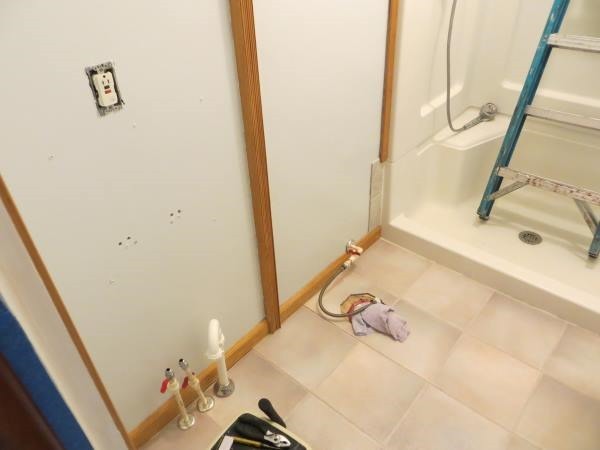 The shower was still out of commission, but the rest of the bathroom was at least functional. 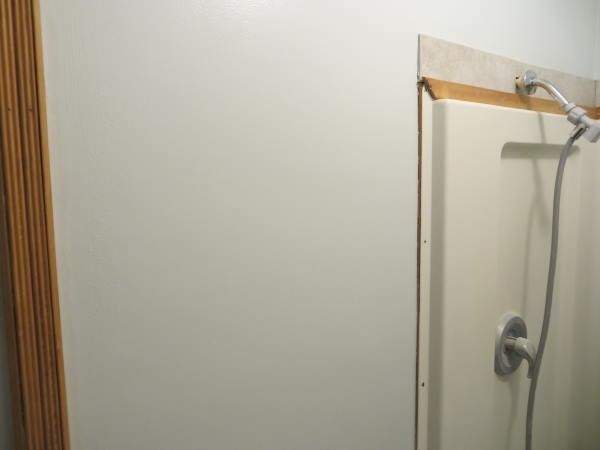 Well, as long as you weren’t squeamish about the lack of door. Next was the shower. I had to wipe it completely down again, to get rid of the dust and debris that had snuck in. 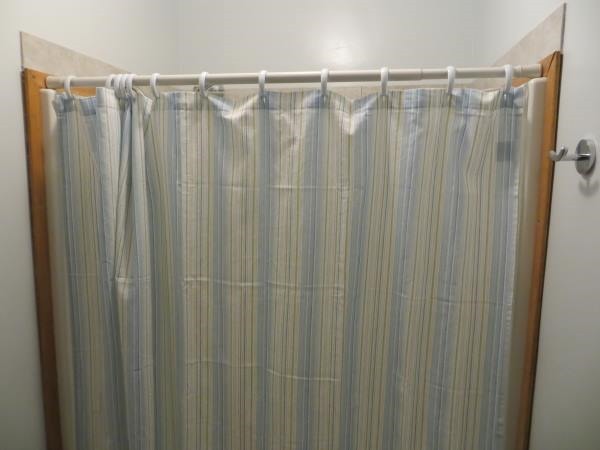 After that, CJ purchased a new shower curtain that would be a better match for the shade of blue now on the walls. Apart from a bit of trim around the door, the single biggest remaining piece was hanging a new cabinet. The old one was basically a metal shelf unit that had been hung on the wall. After much frustration (on my part; CJ was very level-headed throughout this step), we got the cabinet up. To be honest, we still aren’t used to the new look. To me it looks like I’m staying in a nice hotel. All in all, though, we’re both glad it’s done. The weekend before last was a hot and steamy one for CJ and I. We got to spend a lot of good quality time with each other in close quarters. 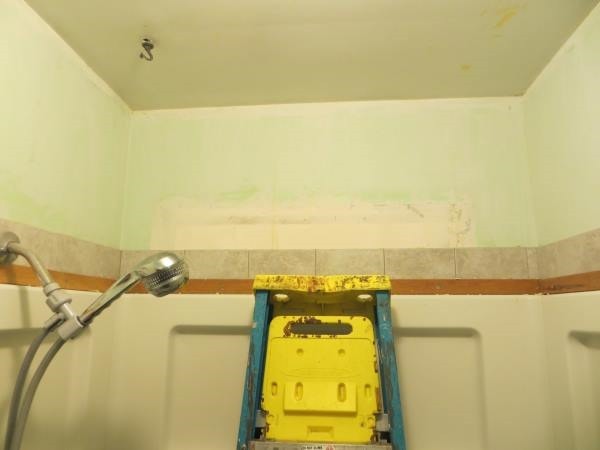 The smaller of our two bathrooms had developed a small problem in the ceiling above the shower. 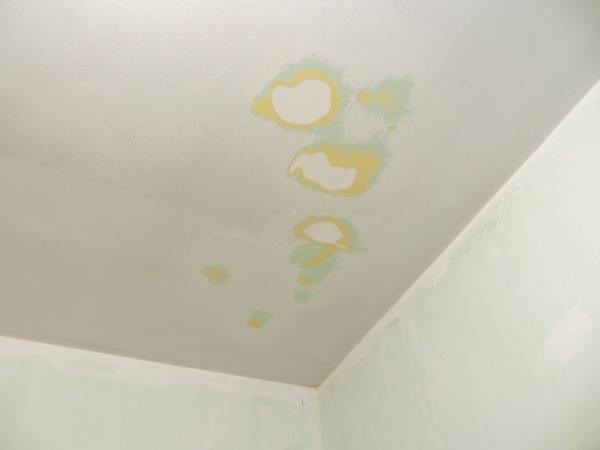 The paint had been cracking and peeling, and we were concerned if we let it go we’d have a mold problem. Since we were going to have to redo the ceiling, CJ thought we should also get the wallpaper down, which was also peeling and cracking. In fact, it was peeling so badly in places that in the days leading up to this fateful weekend, CJ had the girls help her pull some of it down with their bare hands. But the real prep work would be saved for the weekend, when we would presumably have more time, and even some support from the Grandparents in watching the girls. 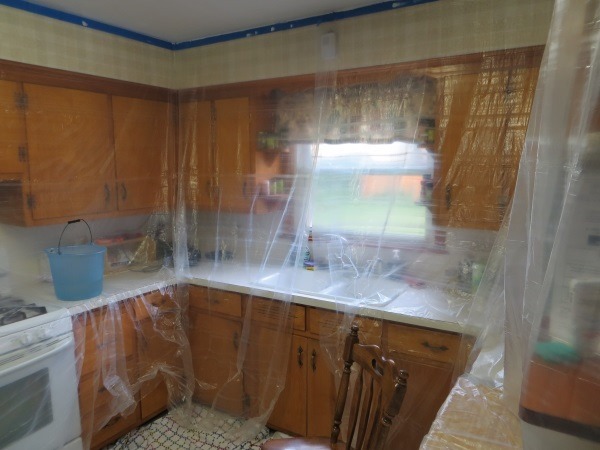 The first step was getting the wallpaper off. That actually was pretty easy. Getting the wallpaper BACKING off? A little trickier. Yes, keep those silly feelings coming dear. We’re going to need them. 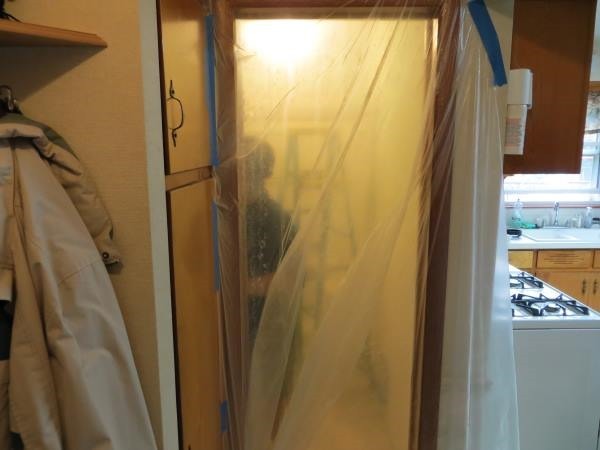 We thought that it would be fairly straightforward to simply run the shower on high, and get the room nice and steamy. And honestly, that did work. Much of the backing – especially the stuff above waist level, came right off. We kept the door shut to prevent the steam from leaving the room too soon, and with both of us in the room stripping the paper and backing off, the water in the room was literally rolling off my face and arms within a few minutes. I had an additional challenge. I couldn’t be in the room for more than 10 seconds without my glasses fogging up. I could actually see better WITHOUT my glasses – and that’s saying something. I spent most of the experience squinting, and get up close and personal with a moist, sticky, peeling, wall. Wahoo. 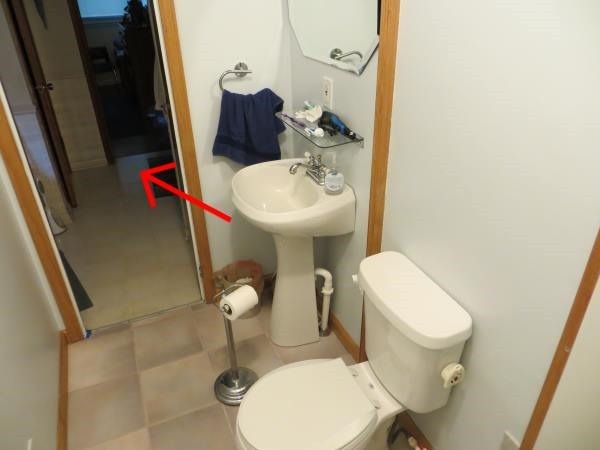 As we worked our way around the room, we discovered that the area around the sink was going to be particularly troublesome. 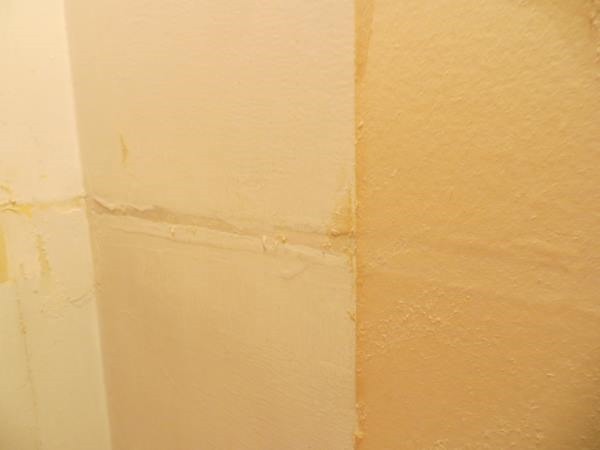 We’re still not sure what our predecessors did, but the walls were not smooth. In fact, it looks like they took all of the scrap drywall they had leftover from the rest of the house, and tacked it up here – in pieces. Then “forgot” to sand or prime anything. 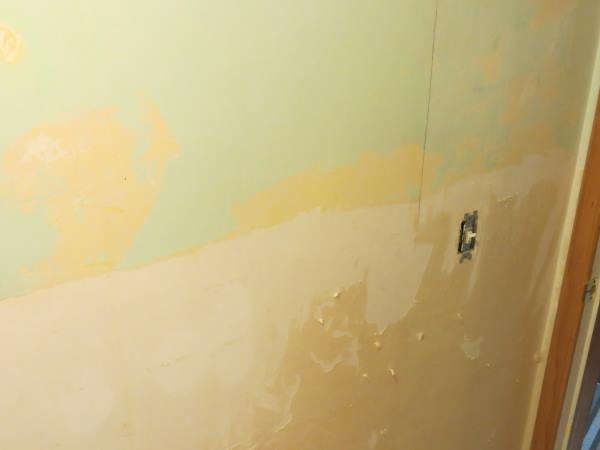 It was far softer, almost like spackling that hadn’t fully cured yet, and white. Then there was most of the rest of the room. 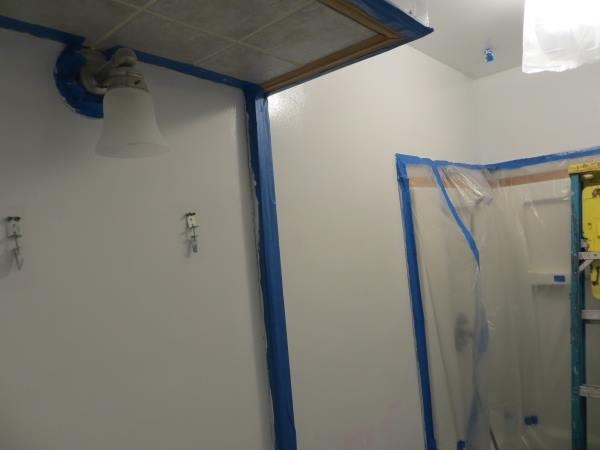 Apparently they had started from the top of the room and worked down, but run out of paint AND primer when they got to waist-level. 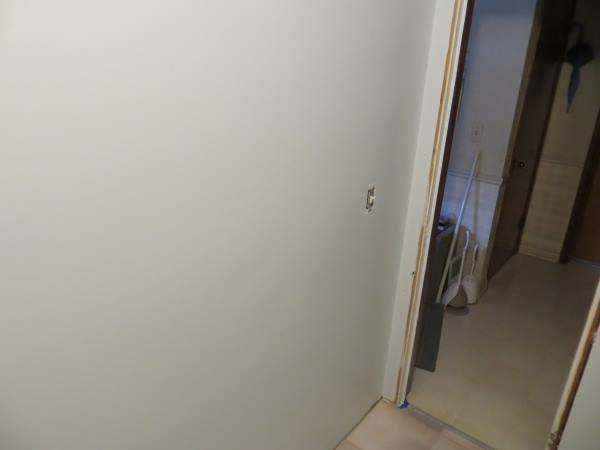 CJ thinks they had half-height paneling that ran around the room at one point, and then removed it to put the wallpaper up. 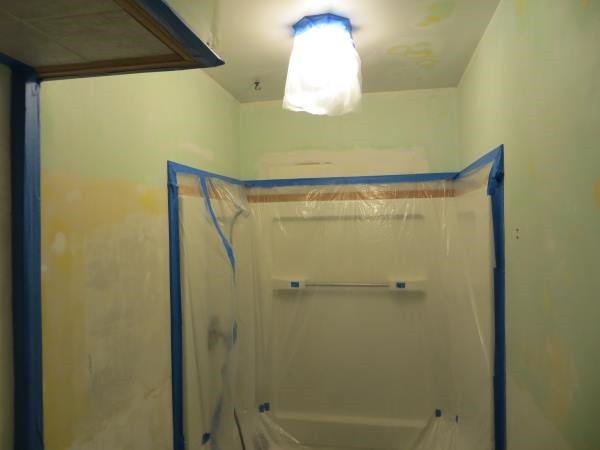 The problem was, no one even bothered to prime the drywall, let alone paint it. That made it much more difficult to get the wallpaper backing off. Similarly, we were not intending to take all of the wood trim – again (naively) thinking we could work around them. With the major fixtures gone, we decided we might as well go all the way. Now that we had all of the wallpaper down, it was time for the sanding! For that lovely task, CJ thought that we should rent a small electric sander. 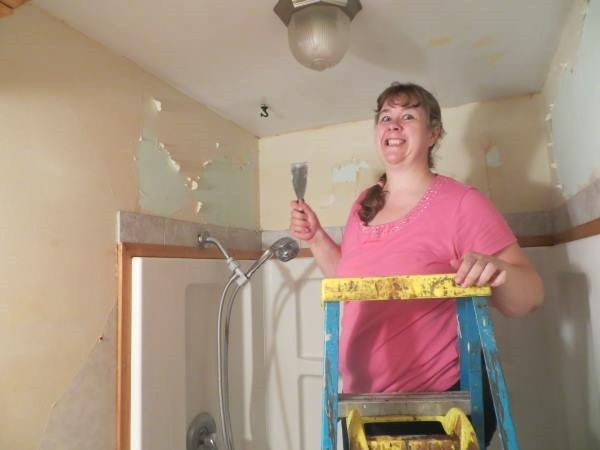 She did not relish having to spend one or more days sanding the walls by hand. A trip to Home Depot took care of that nicely. This was Monday the 10th. Our next challenge was health-related. Lucy had been running a fever for most of the last 24 hours, and the night before had been complaining about her ears hurting. On Monday morning, she woke up and clearly had pink eye. So, not only would Lucy NOT be going to school today, we would have to juggle the bathroom and having her at home, AND we would have to get her into the pediatrician. After hitting Home Depot first thing in the morning, CJ and I split up. CJ went home to start getting the bathroom prepped for sanding, while I took Lucy into the doctor. It was nearly lunch by the time Lucy and I had gotten home, by which point CJ was able to set up our new oxygen tent. Now, I had fully intended to help CJ with the sanding, but with Lucy sick one of us pretty much had to be on call if she needed something. Since CJ had already started the sanding, and since we only had the one sander, I decided to play a supporting role, and bounce between CJ and Lucy. At one point, I heard “Woohoo! It’s Christmas!”. I walked to the bathroom, amused. 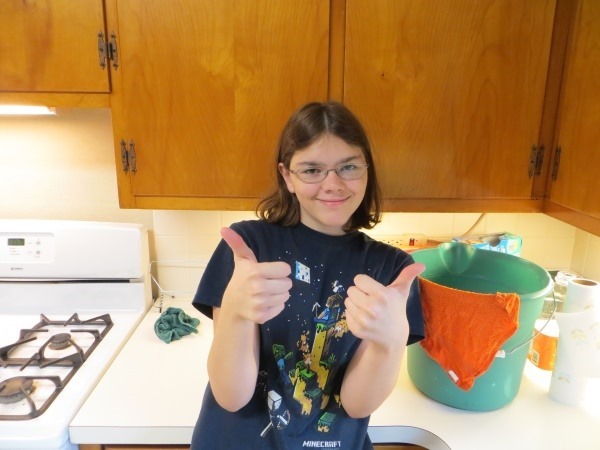 CJ explained that while she was sanding the painted surfaces, the dust being kicked up wasn’t too bad. As soon as she touched the raw drywall, though, the room exploded into a fine white dust. She literally couldn’t see anything for a couple of minutes, until the cloud settled. After the sanding was pretty much done, CJ emerged from the tent, and went outside to dust herself off. 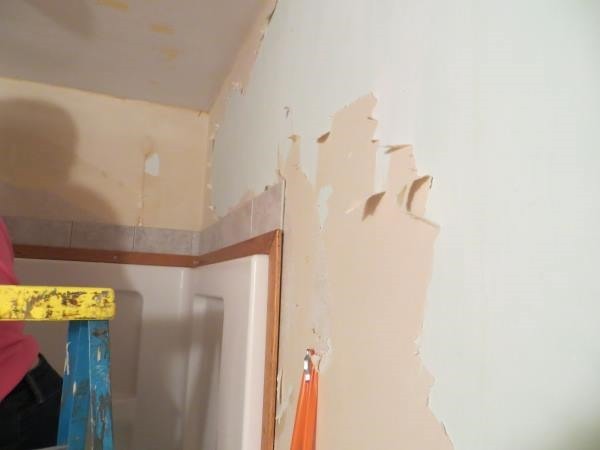 Next up was spackling the many ding, dents, and holes in the walls. As expected, the area around the sink was particularly bad. The ceiling, which started this whole adventure, turned out pretty well after the sanding. 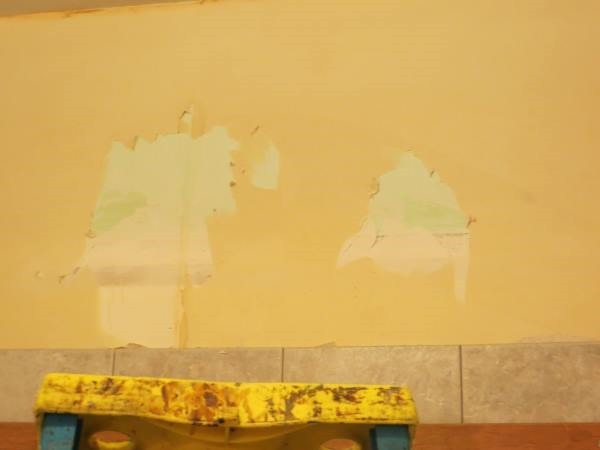 Once we had everything spackled and had let it dry, we had to sand it down again. Luckily, that only required some sanding sponges. 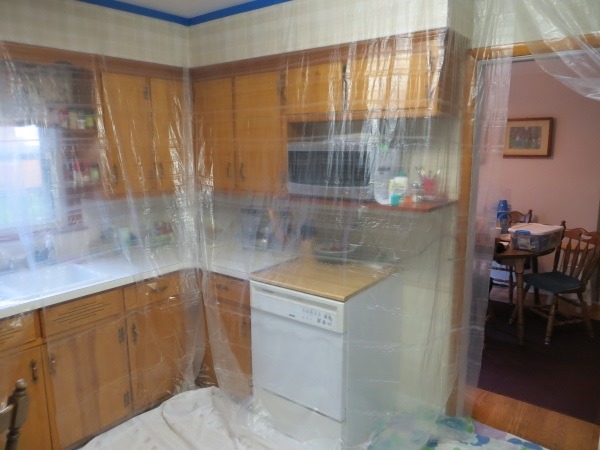 I still can’t decide if we went a little overboard with the tape and plastic, not to mention the newspaper we taped down to the floor, and the dropcloths we laid on top of them. 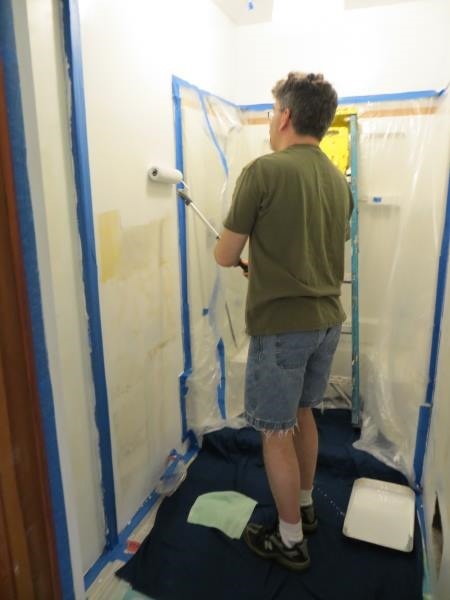 But it sure made priming and painting easier. Not more sane, just easier. 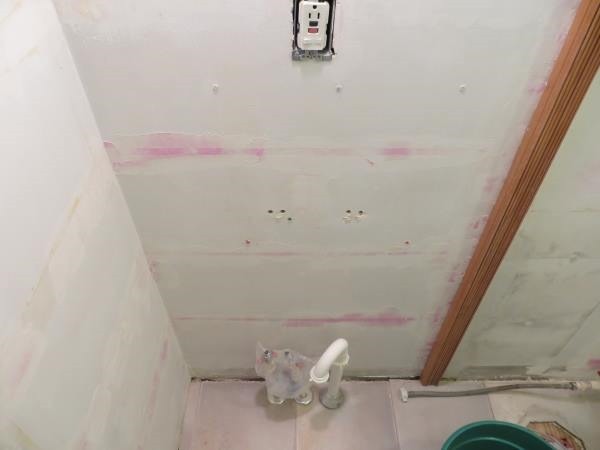 We really only expected to have to put down one coat of primer, but after it dried we saw how the sink section was STILL looking rough and ugly, so CJ put down a second coat. That made a world of difference. Overall, I think all of the preparation turned out well. We got to this point by Wednesday. The next step was painting. Unfortunately, even while Lucy’s health was on the mend, mine and CJ’s was about to go downhill. See Part 2 for the conclusion of this epic adventure. I have a spotty record when it comes to home improvement. 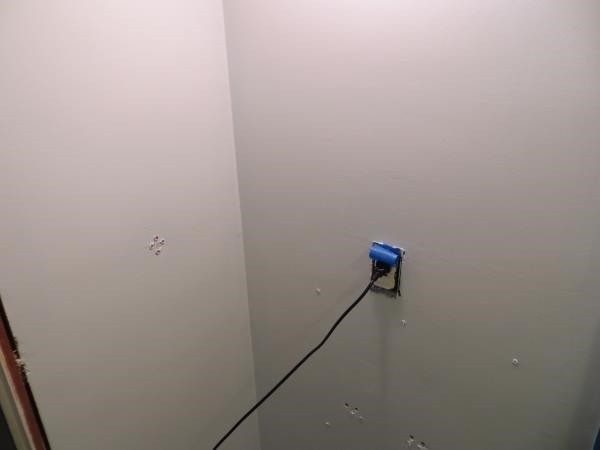 Small electrical jobs like replacing light switches or outlets I can do. Larger jobs like replacing a ceiling fan? Yeah, those tend to turn into blog posts – long, drawn out blog posts documenting every assumption I made at the beginning of the project and later disproved, every step I missed in the directions, and every step that was just flat out wrong. Thankfully, I have yet to endure the embarrassment of calling in a professional to finish whatever it was I started. Somehow, even when things are at their darkest, my wife manages to talk me down off the home-improvement ledge so we can finish it ourselves. 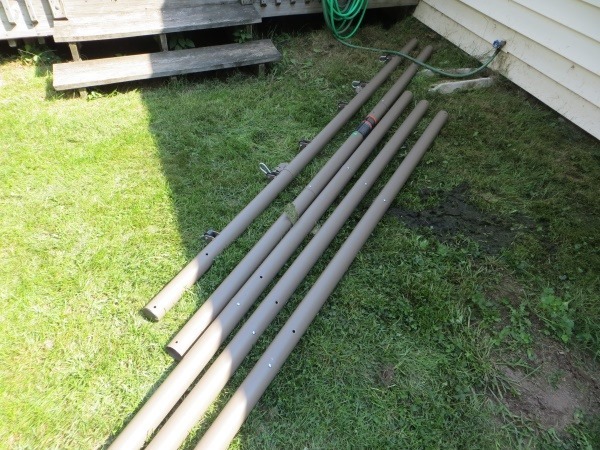 Last week, I decided that it was time to repair the railing for the stairs leading to our basement. 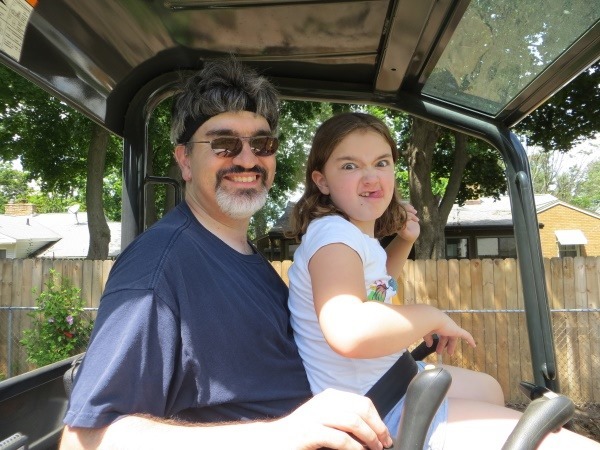 I had taken a few days off of work, and both of my girls would be out of the house for at least the mornings those days, so there didn’t seem to be any better time. Two out of the railing’s three brackets had been slowly pulling free of the wall, and that was putting stress on the third. I figured it was only a matter of time before someone lost his or her footing, grabbed the railing to stop themselves, and realized half a second later that the railing was in free fall with them. It needed to be fixed. What I had going for me was that there would be no ceiling fans involved. What was working against me was the very tight time frame. My wife was only allowing me to start this if I could give her some assurance that I could have it back in place that day, ideally before the girls were home. I was pretty confident that I could make this work somehow. I feared it would turn into something that was worthy of a “look at the mess that Mark got himself into” blog post, requiring several days of work. In fact, halfway through the project I even made a comment to that very effect – “I just hope this doesn’t turn into a blog post”. As it turned out, I needed two attempts to get the railing brackets remounted, and a trip to Home Depot for a replacement piece of wood, but otherwise it went back together fairly smoothly. What’s better is that it is now solid – no more wiggle when you walk down the stairs. The middle mount doesn’t blend in as well as the previous one did, but I was really going for function rather than style. Yay for no “long construction blog post”.